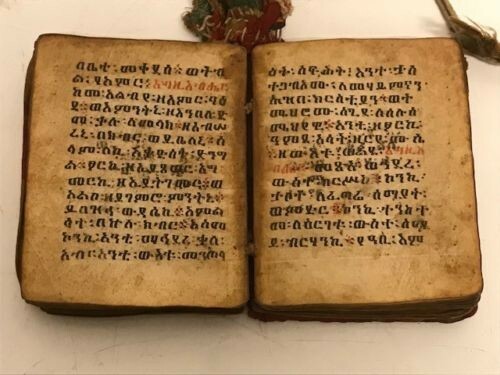 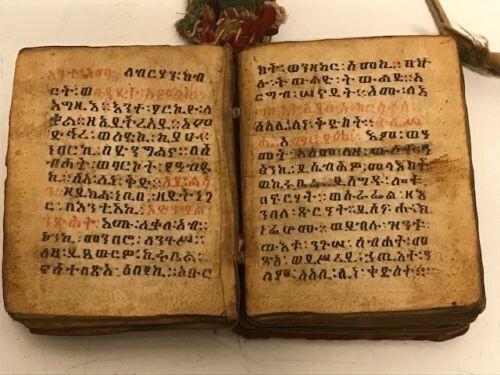 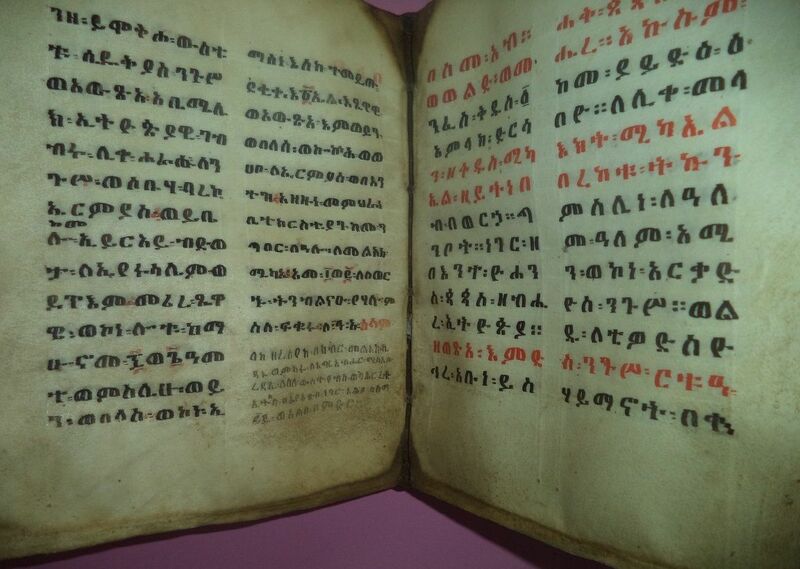 Ethiopia has a large history of Biblical translation. 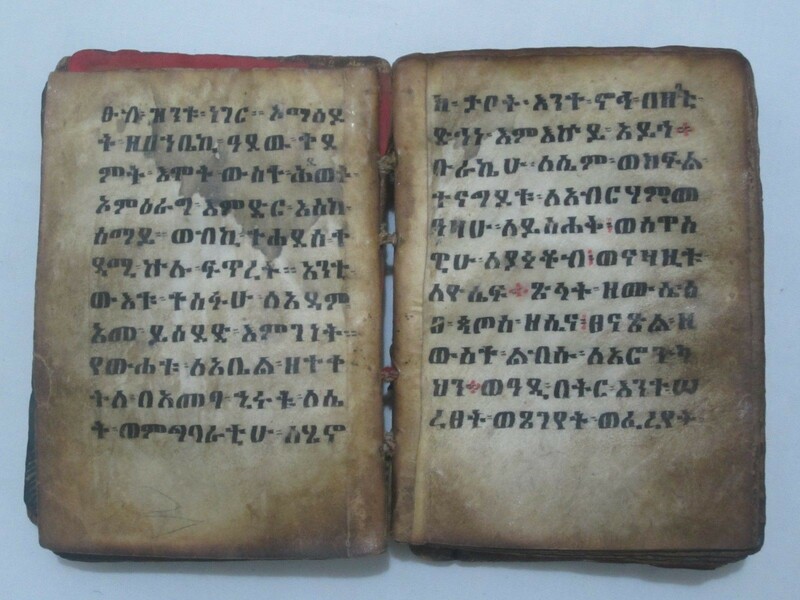 In fact, parts of the Bible were already translated to Ge’ez as early as 350 A.d. And the whole Bible was available in this language by the 600 A.d.This language derives from the Arabic and it disappeared as a spoken language probably before the 10th century AD, although it is still the liturgical language used nowadays by the Ethiopia Orthodox Church and it was the only official written language in Ethiopia until the late 17th century- early 18th century. 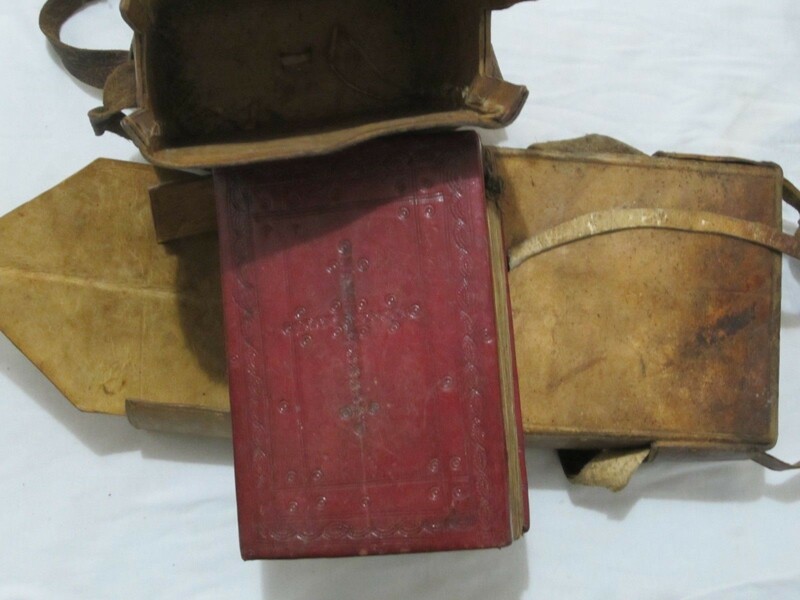 Therefore, currently, it is only in Sacred books as this one (Bibles, Breviaries, Psalters and similar prayer books). 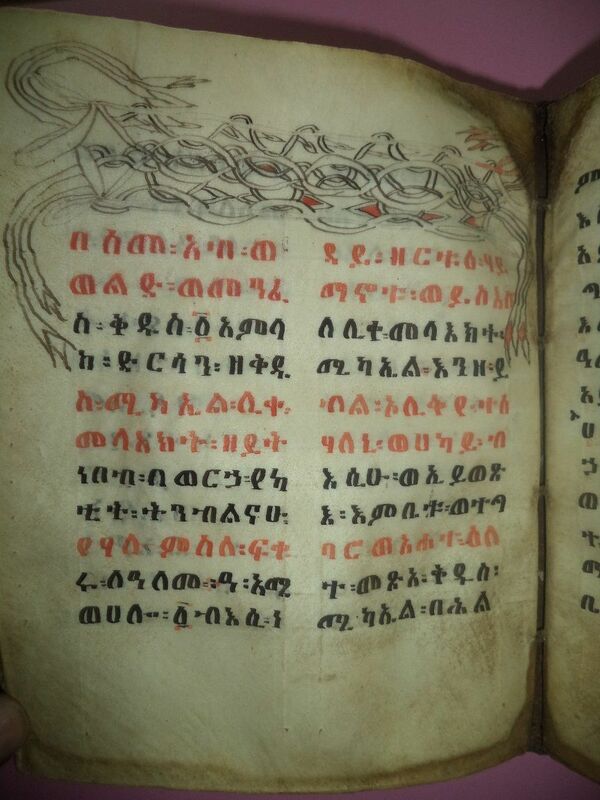 The parts written in red are specific mentions to Holy or relevant words. 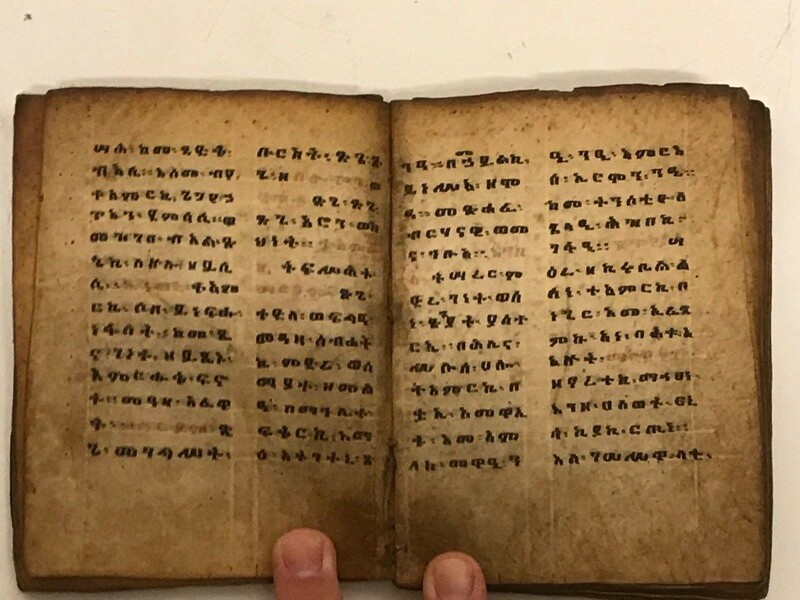 All the text is legible in every page. 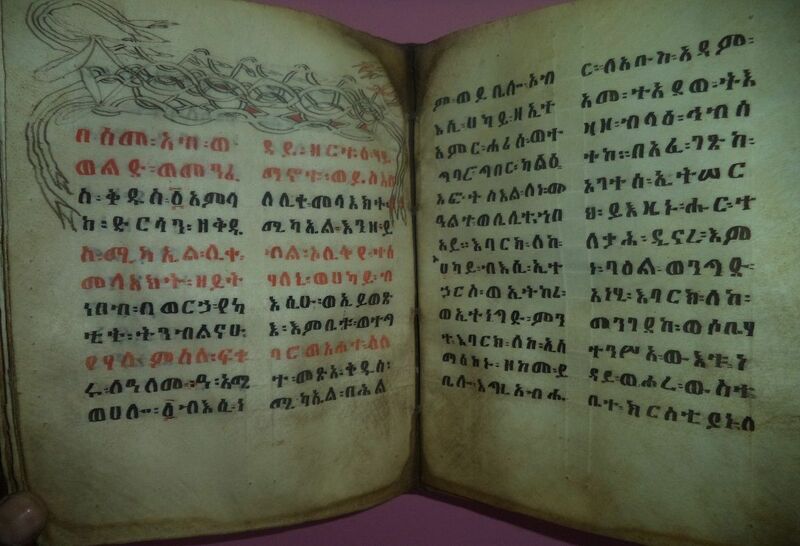 Each page in the manuscripts from Ethiopia is written by hand in Ge'ez on vellum using red and black ink and vellum is fine parchment from a calf or goat skin - Parchment leaves inscribed with black and red in the Ethiopian script on both sides of the leaves - the red ink is used for religious saints or names of holy figures. 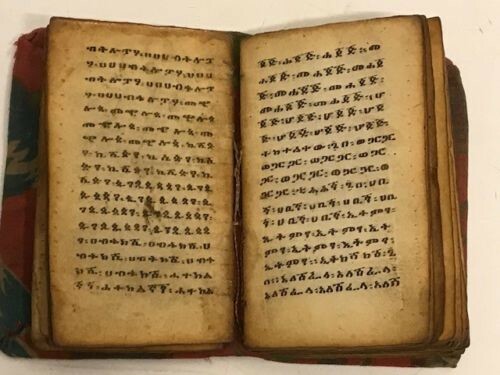 180809 - Antique Ethiopian handwritten coptic manuscript. 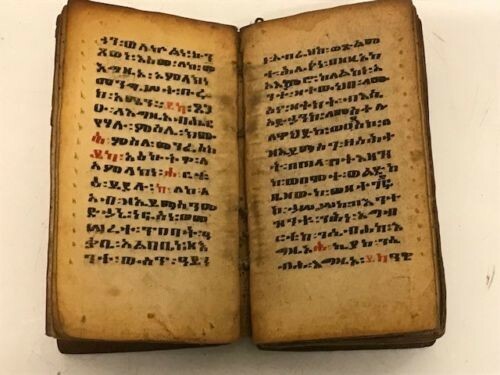 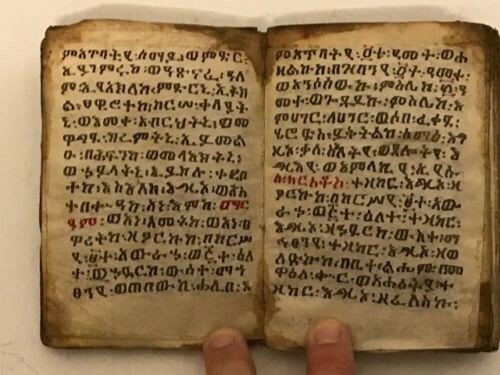 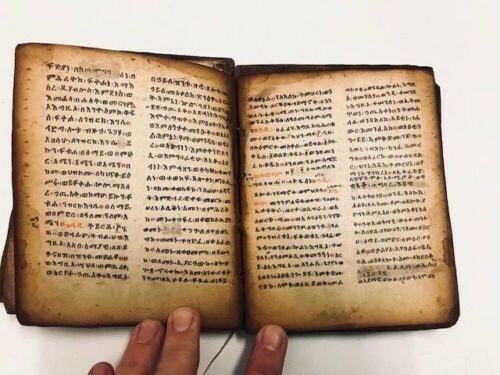 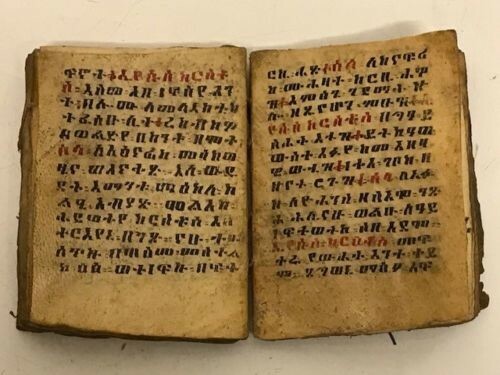 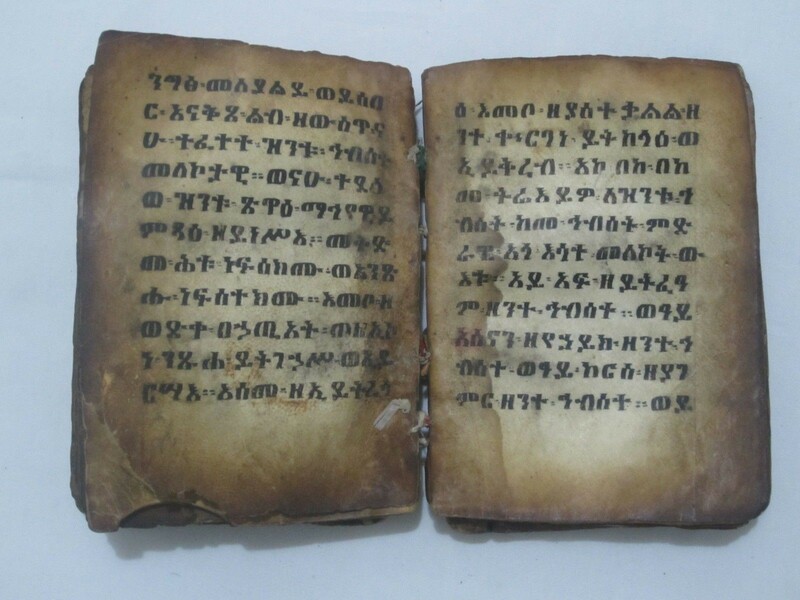 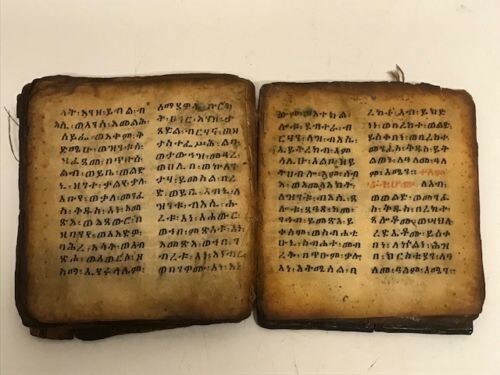 Ethiopia Very old Ethiopian coptic Ge’ez manuscript or bible. 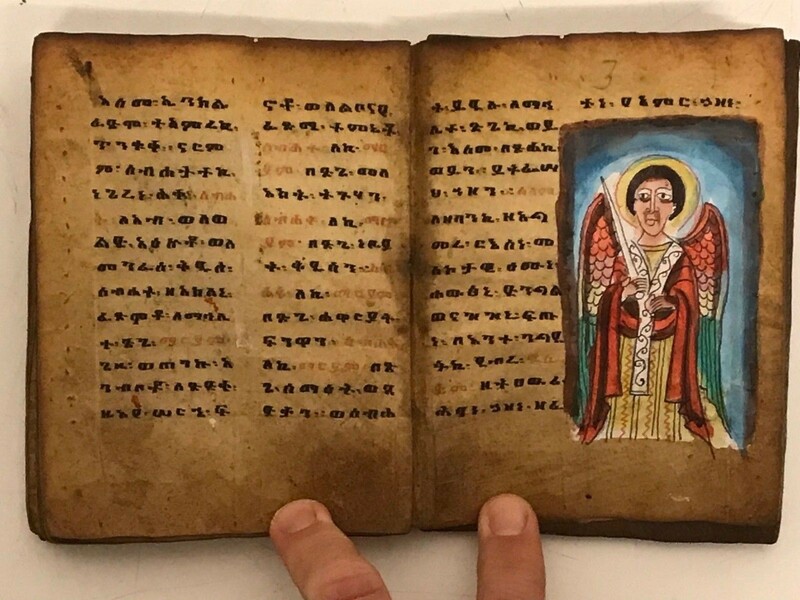 This Coptic manuscript is made in the 19th century. 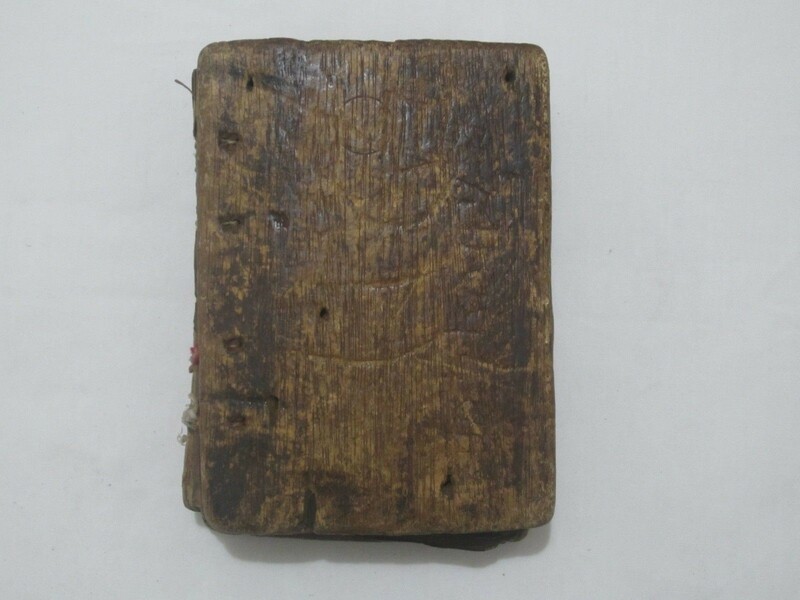 Size are 9 cm x 7 cm. 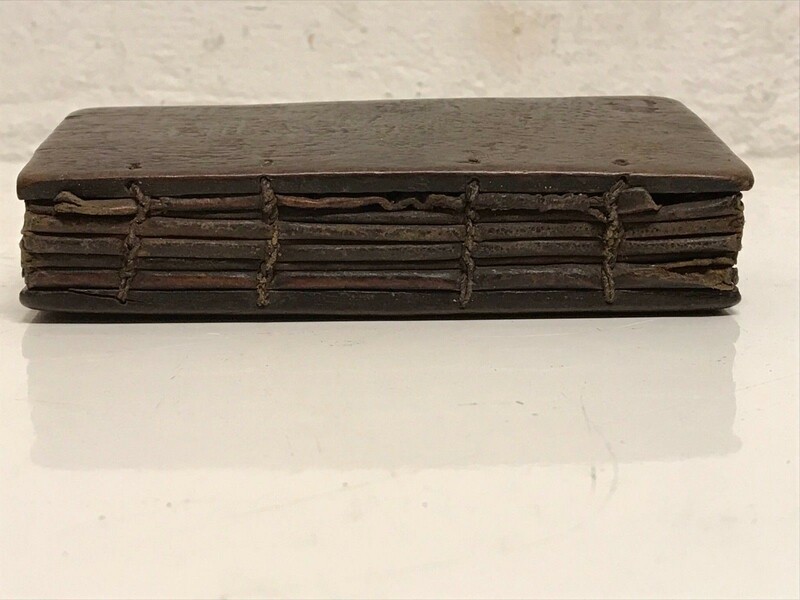 Total 158 pages with 79 leaves with wood covers. 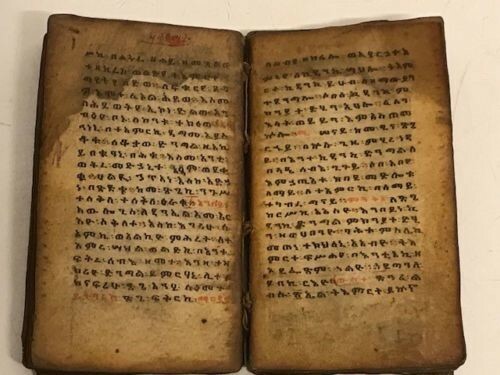 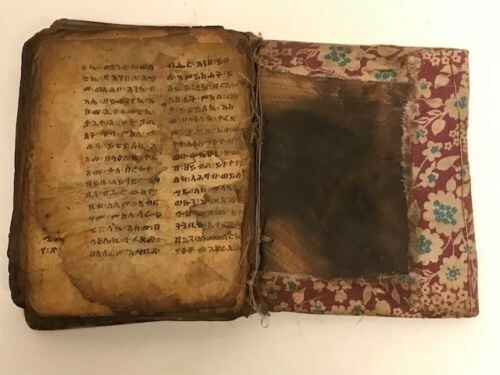 180675 - Antique Ethiopian handwritten coptic manuscript. 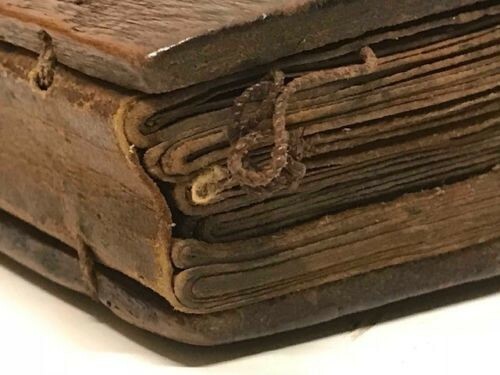 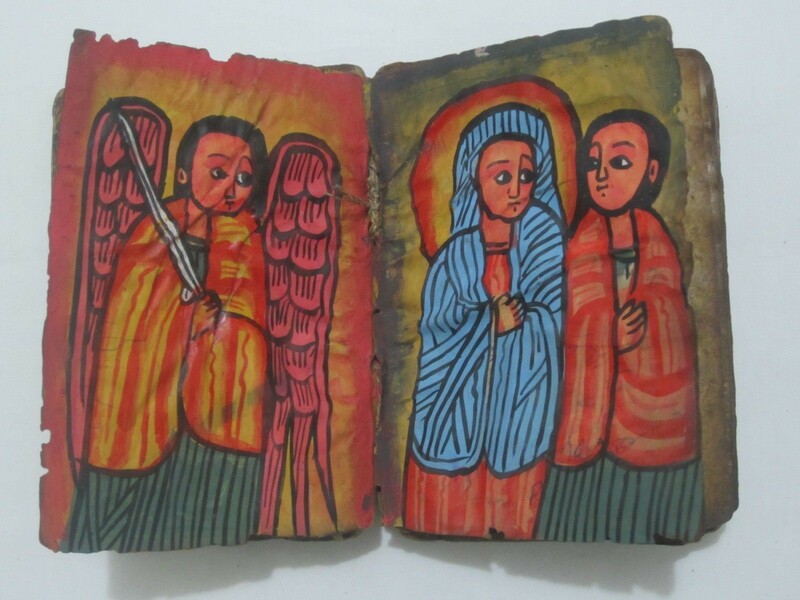 This Coptic manuscript is made in the 18th century. 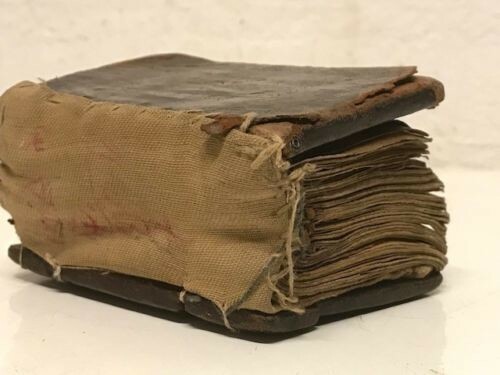 Size are 12 cm x 9 cm. 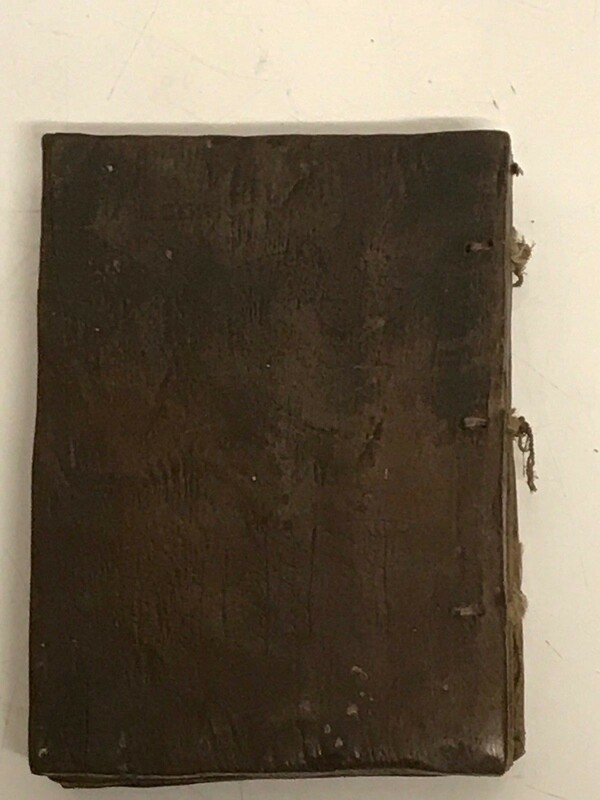 Total 70 pages with wood covers and cotton. 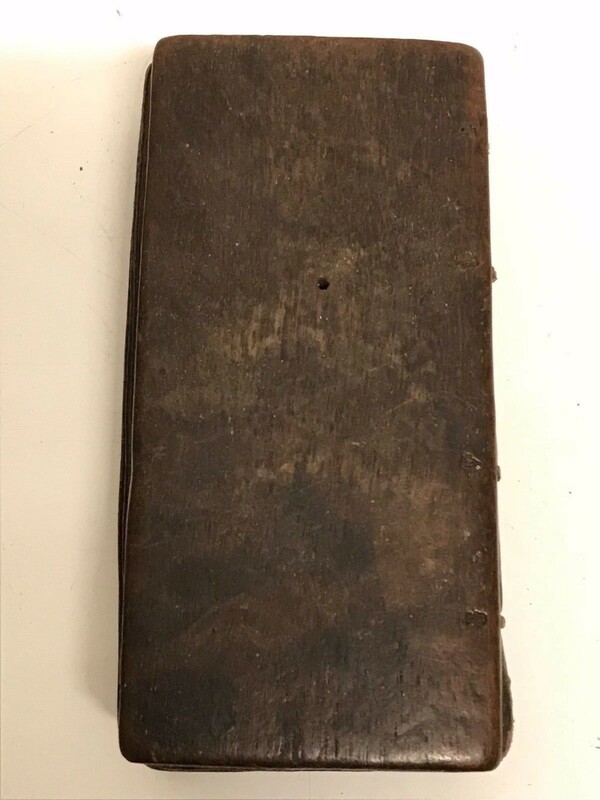 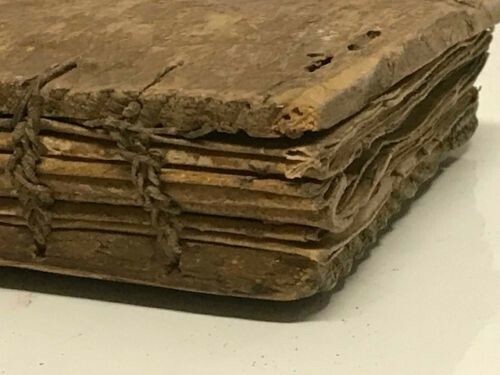 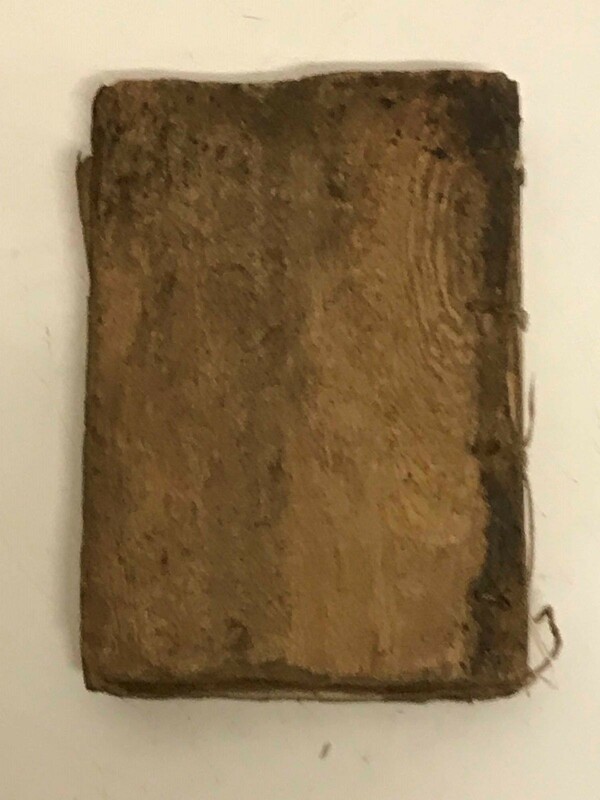 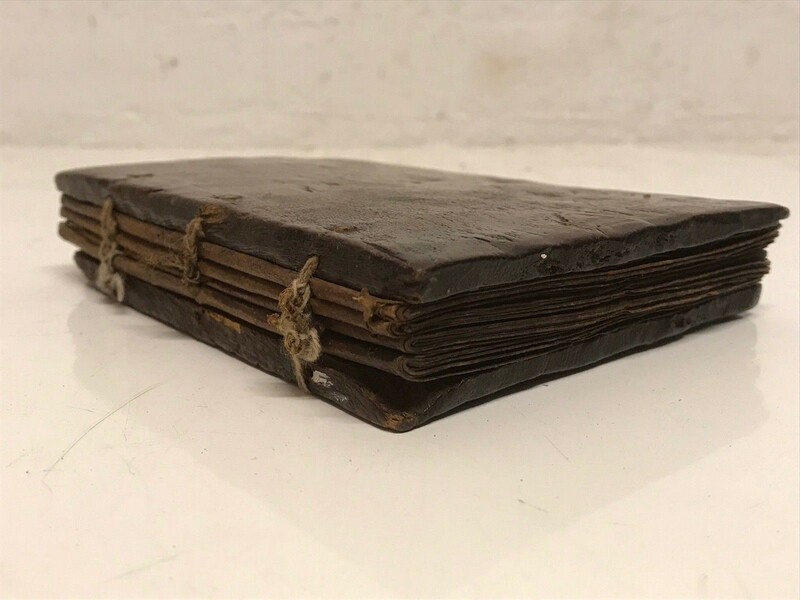 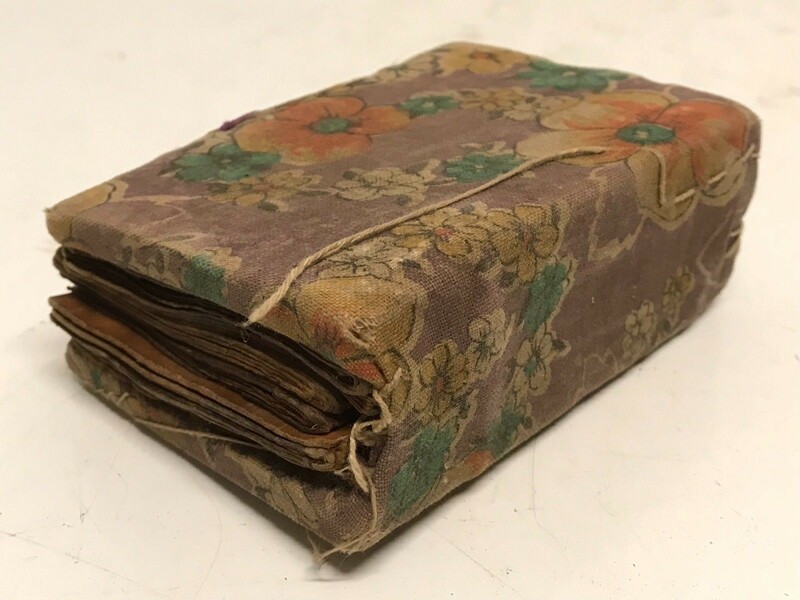 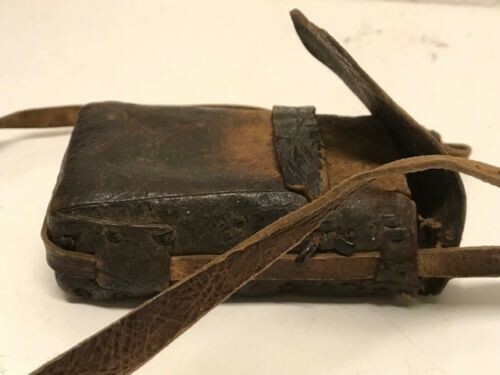 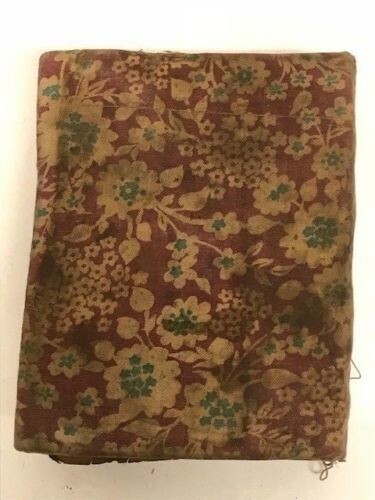 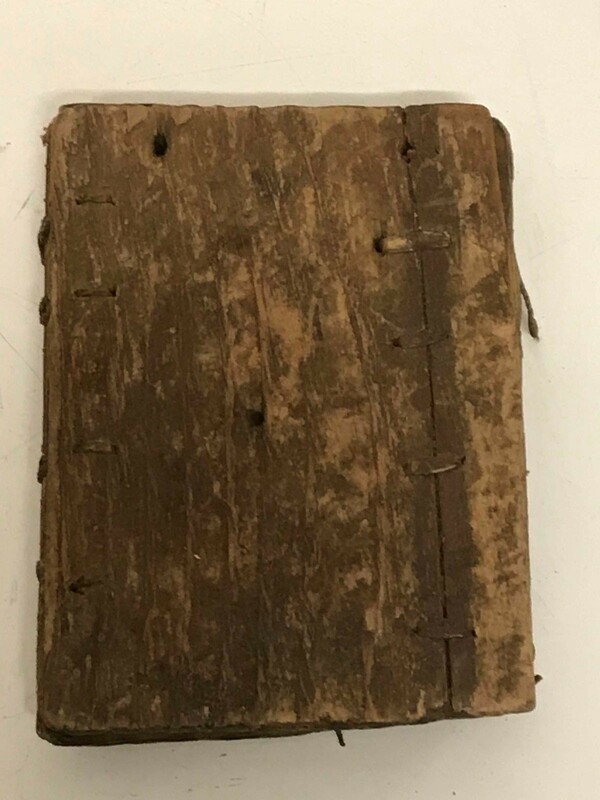 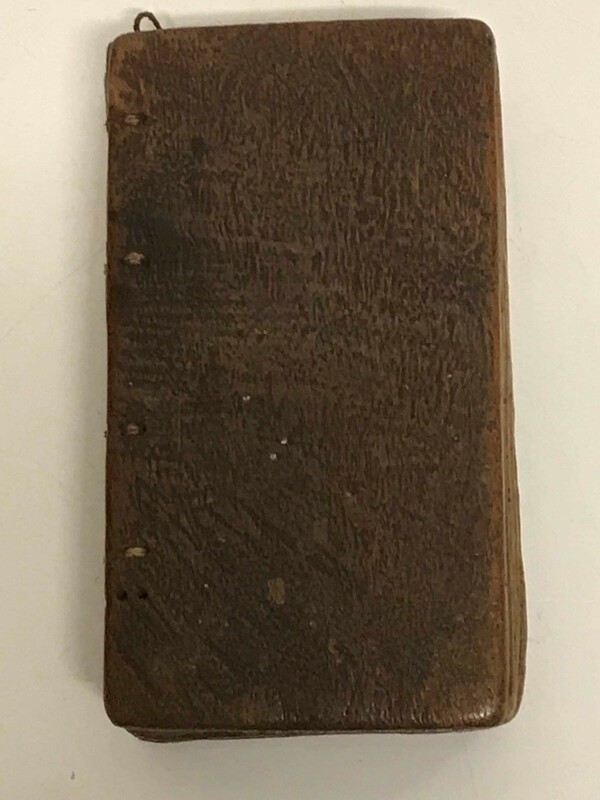 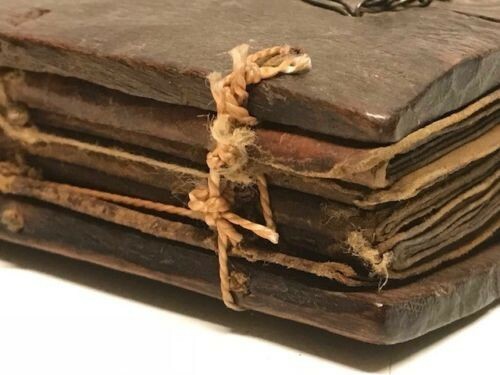 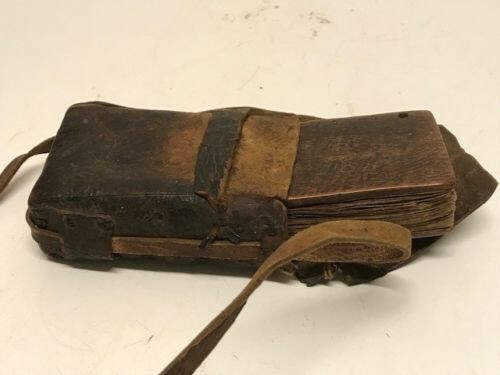 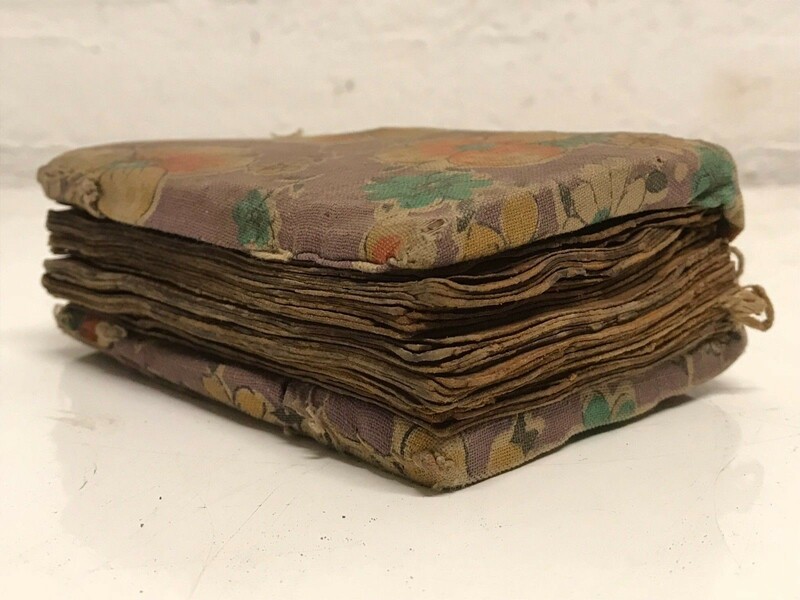 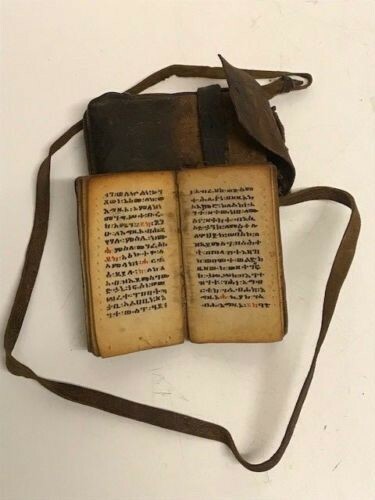 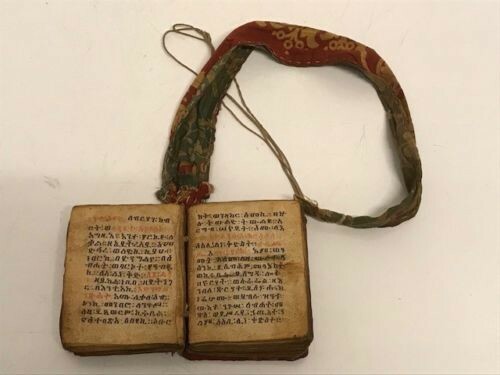 180807 - old Ethiopian handwritten coptic manuscript with leather bag. 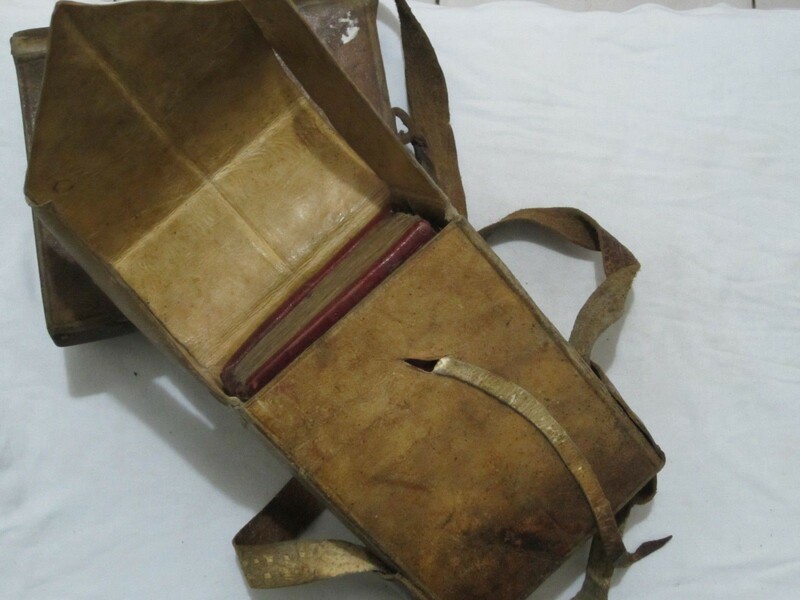 Size are 12 cm x 6.5 cm without the leather bag. 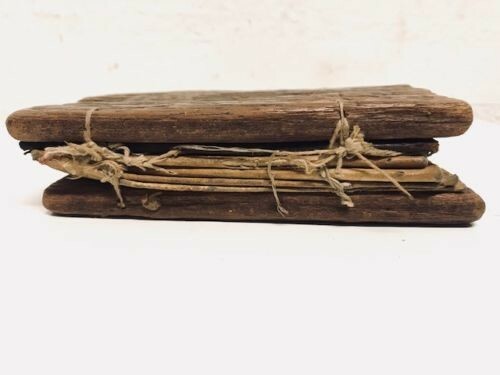 Total 100 pages with 50 leaves with wood covers. 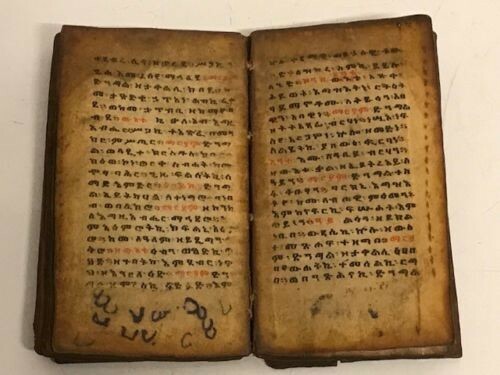 180808 - Antique Ethiopian handwritten coptic manuscript. 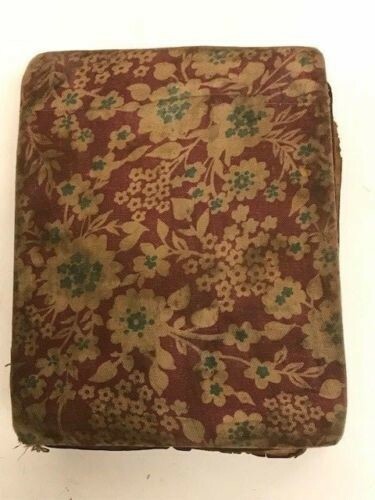 Size are 16 cm x 15 cm. 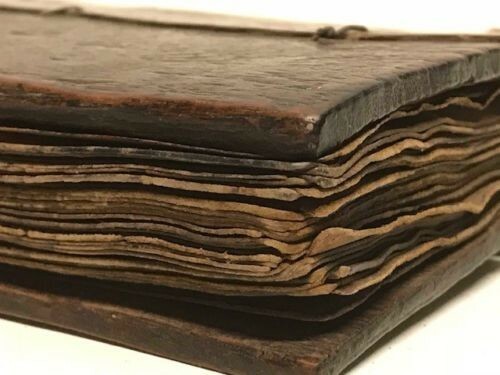 Total 86 pages with 43 leaves with wood covers. 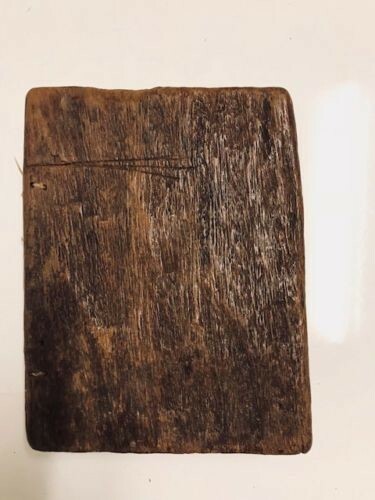 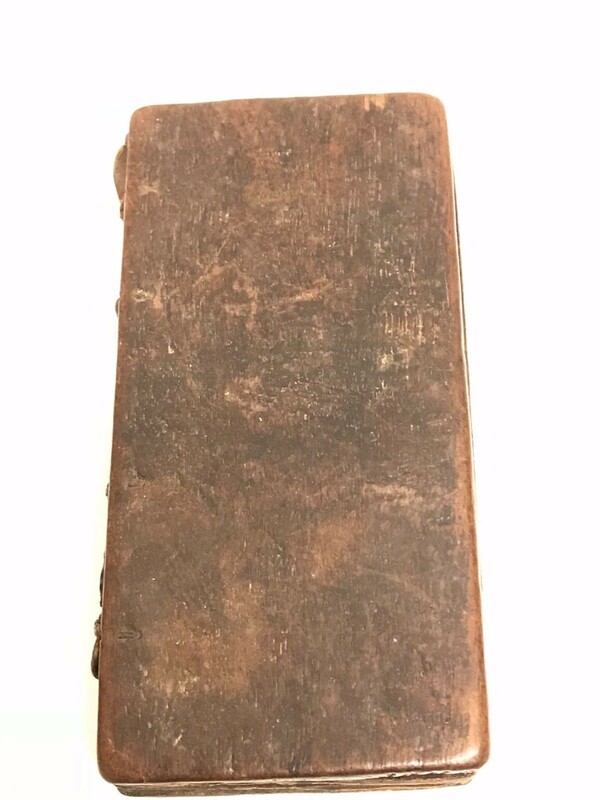 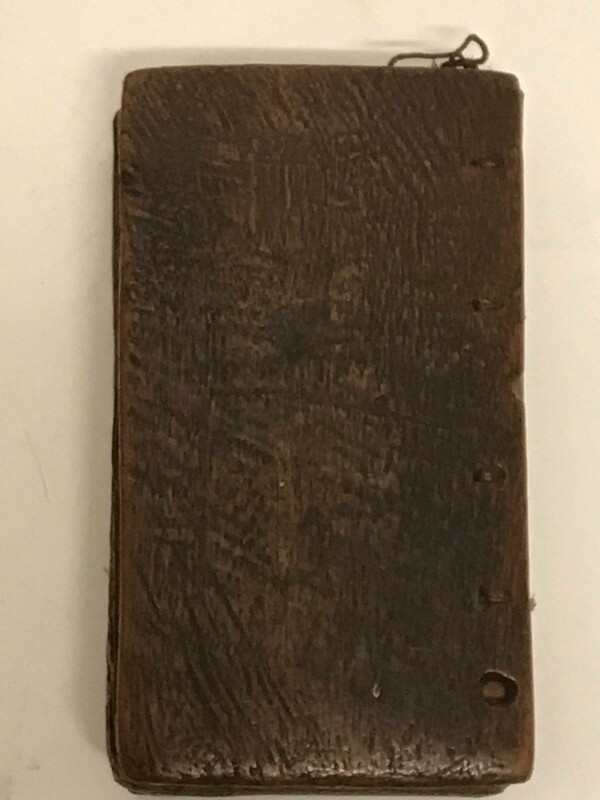 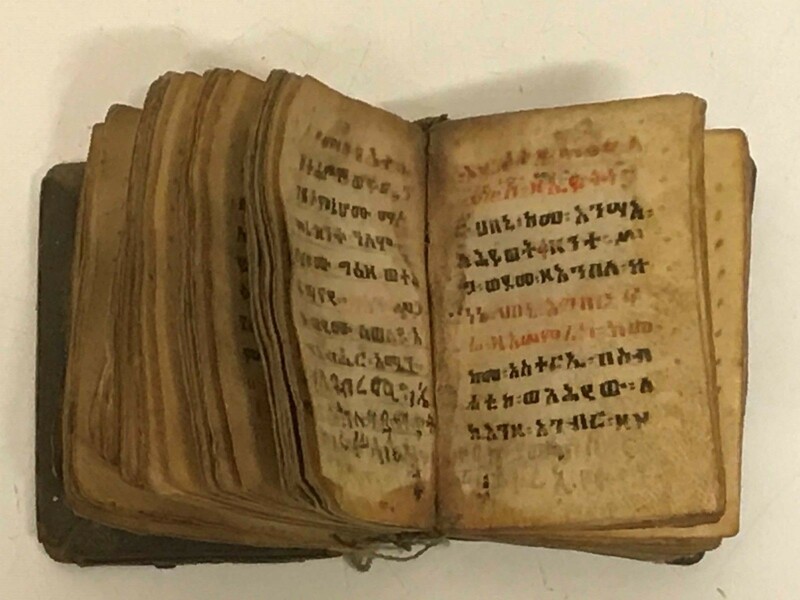 180811 - Very old Ethiopian handwritten coptic 18th cent. 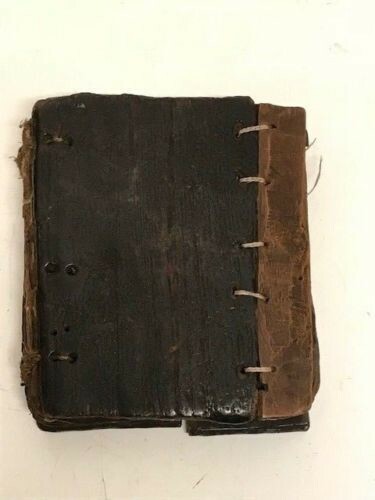 manuscript. 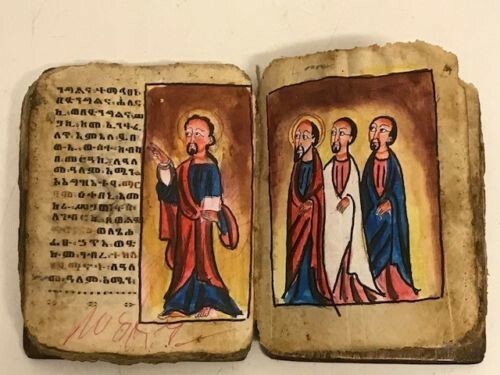 LARGE Ethiopia Very old Ethiopian coptic Ge’ez manuscript with 4 handpainted icons. 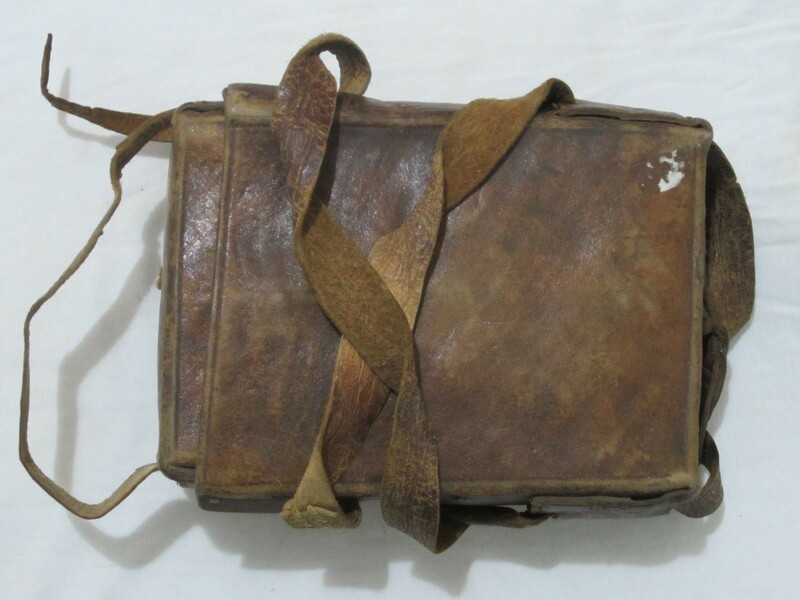 Size are 22cm x 18 cm. 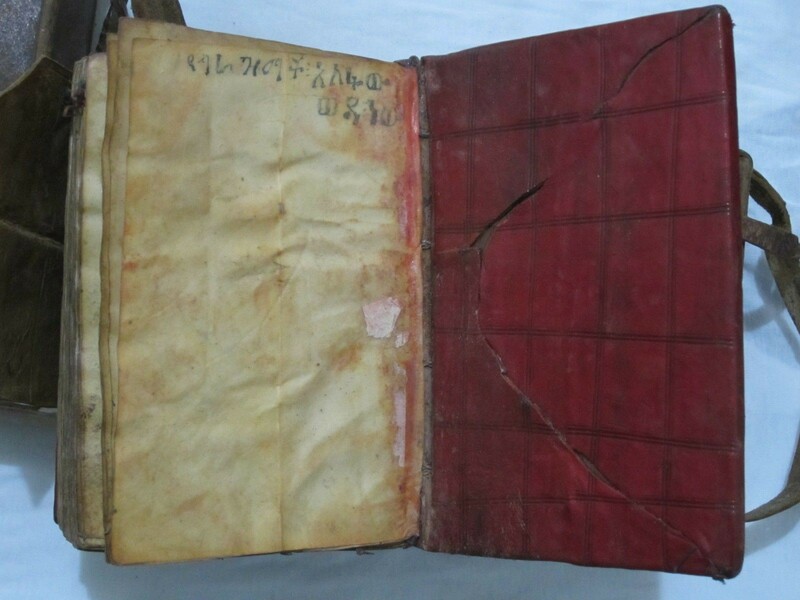 Total 148 pages with 74 leaves with wood covers and cotton. 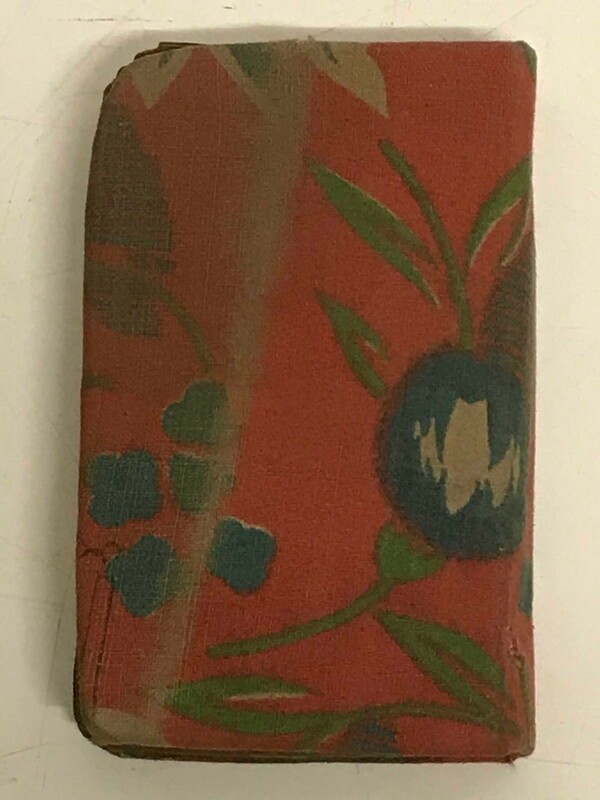 Size are 10 cm x 8 cm. 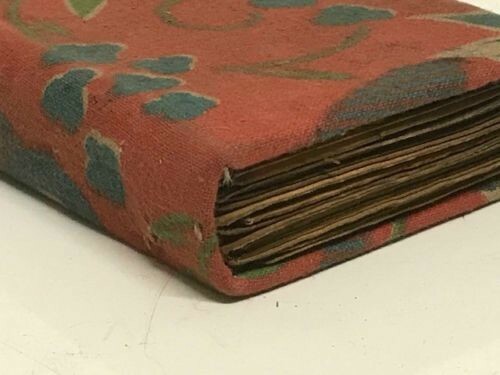 Total 144 pages with wood covers and cotton. 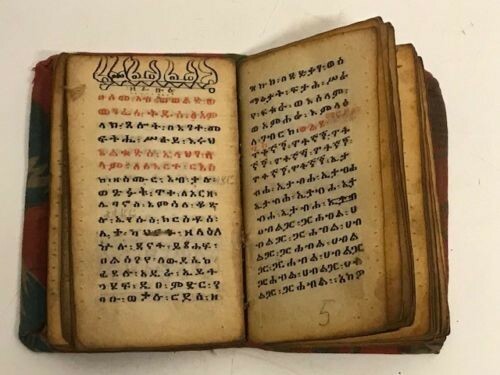 180531 - Ethiopian handwritten coptic manuscript from the 18th century. 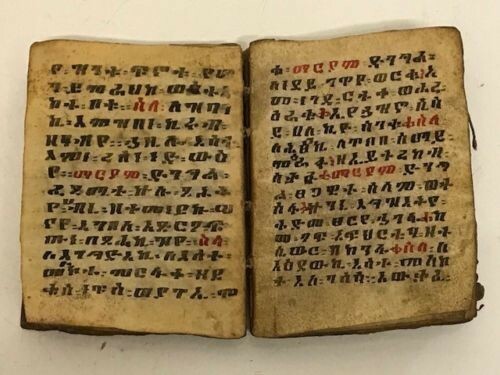 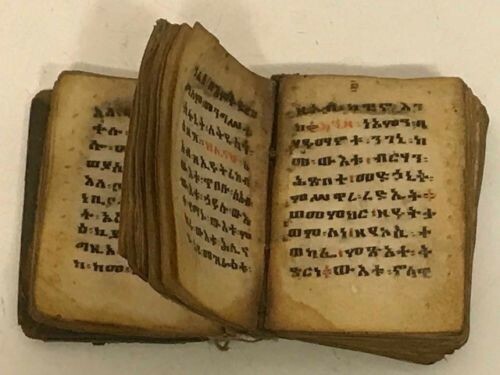 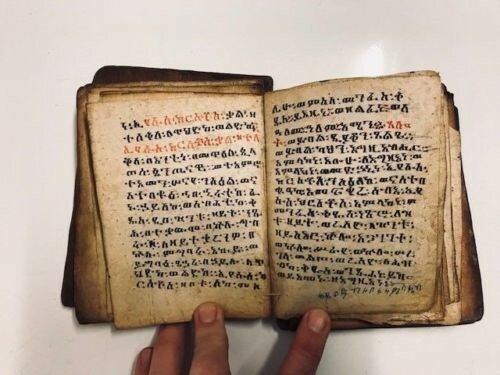 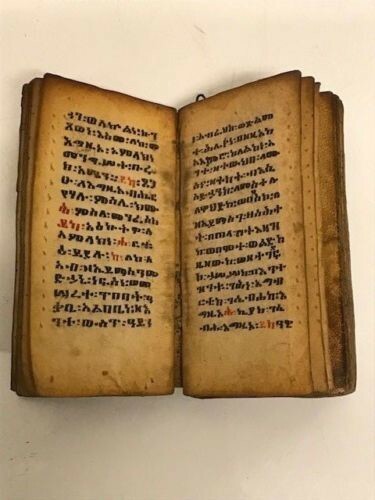 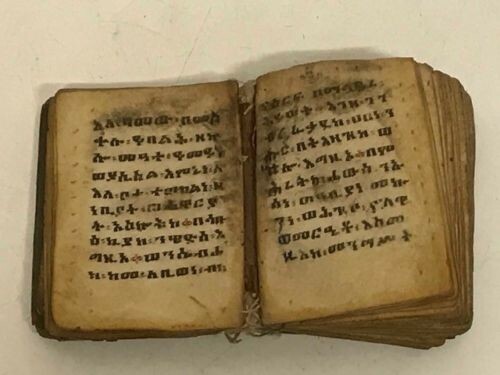 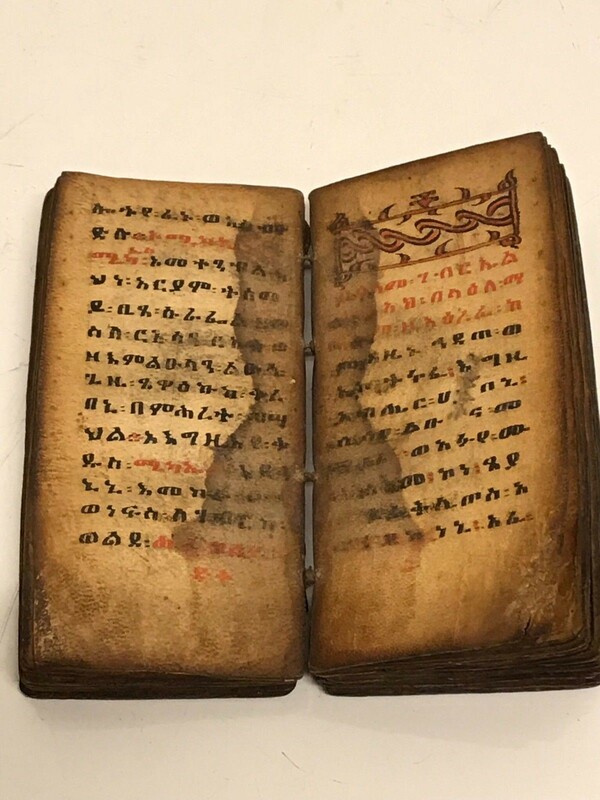 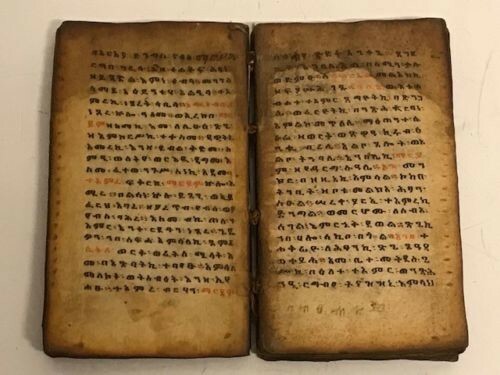 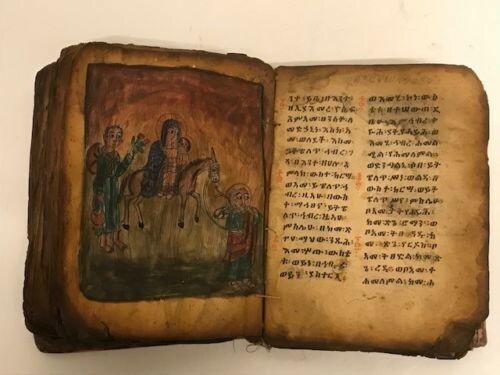 Ethiopia Very old Ethiopian coptic Ge’ez manuscript. 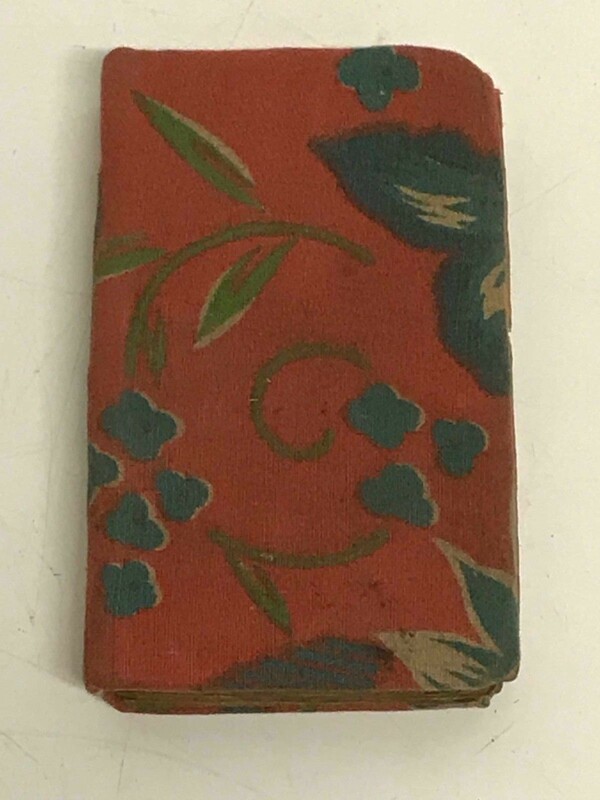 Size are 11 cm x 8 cm. 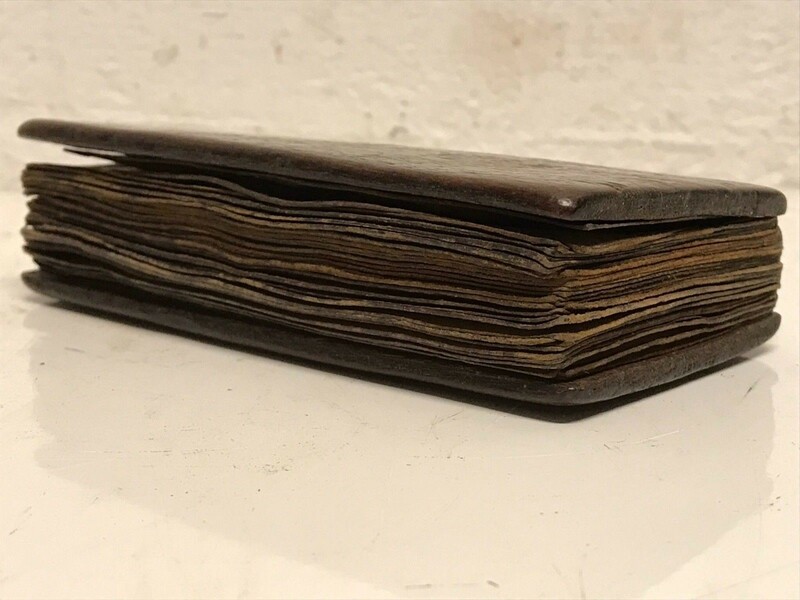 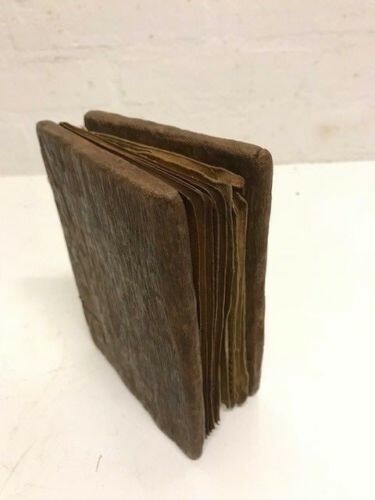 Total 96 pages with 48 leaves, bound between two book covers made of wood. 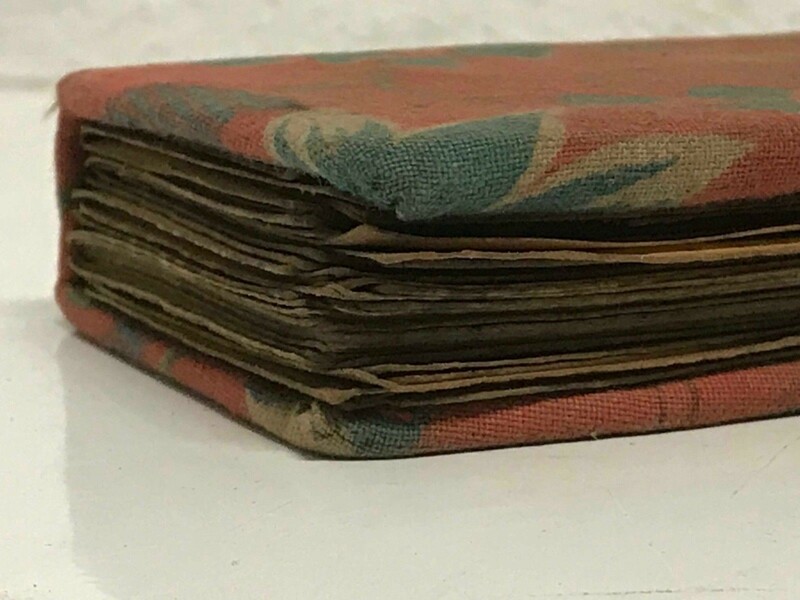 Size are 15 cm x 12 cm. 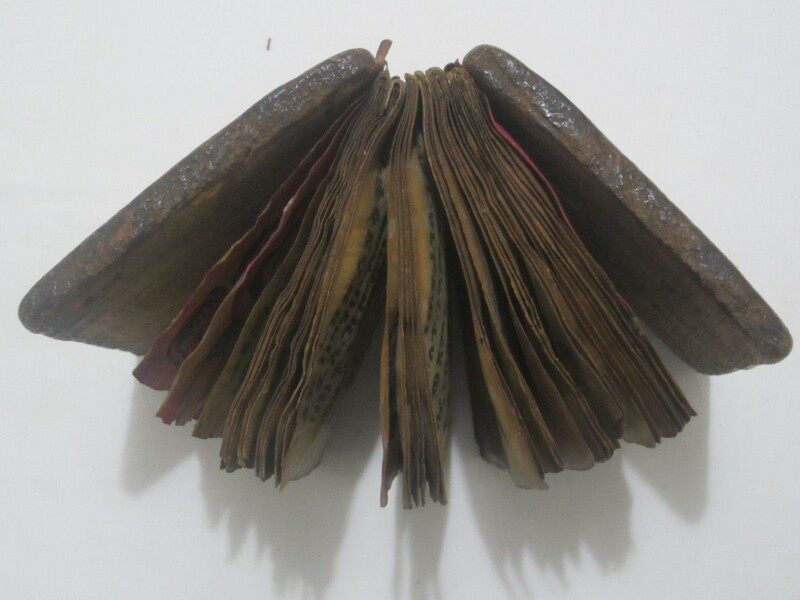 Total 74 pages with 37 leaves with wood covers. 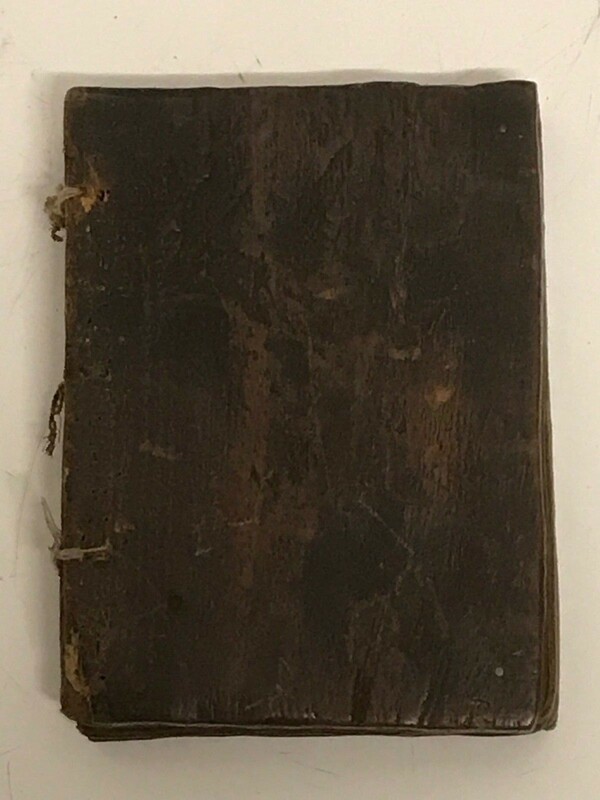 Size are 13 cm x 8 cm. 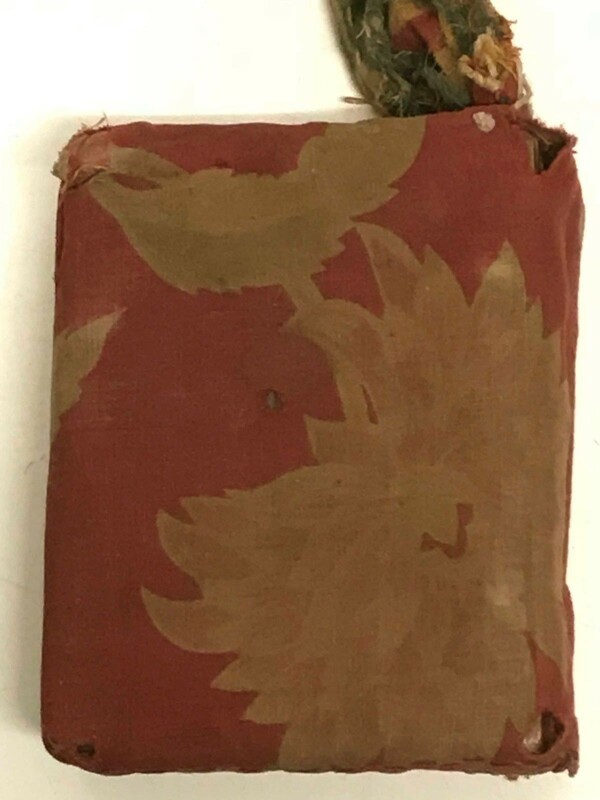 Total 118 pages with 59 leaves with wood covers with cotton. 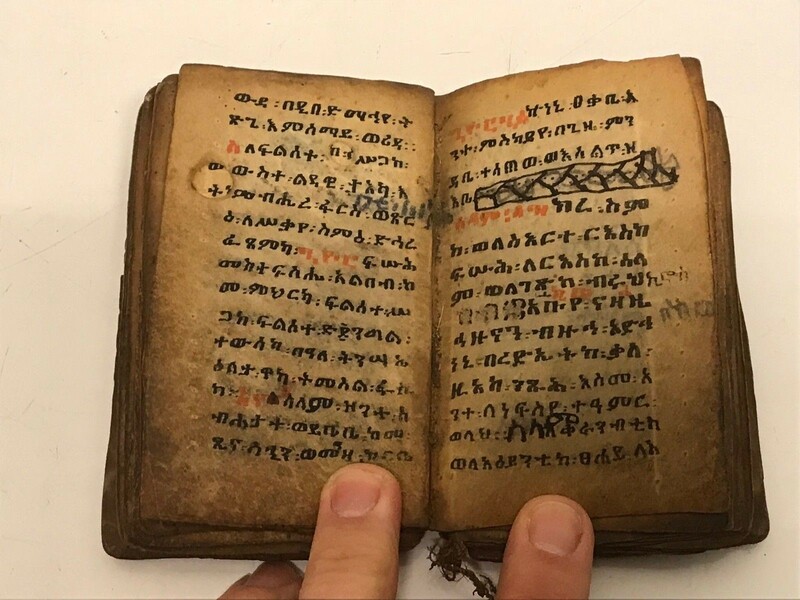 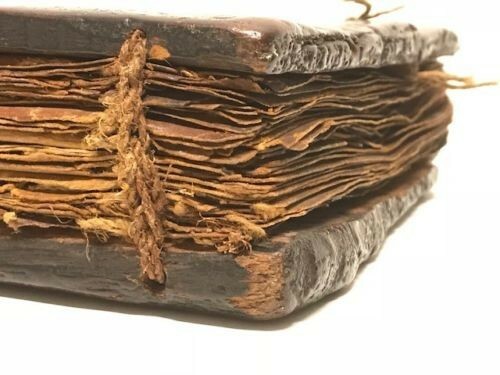 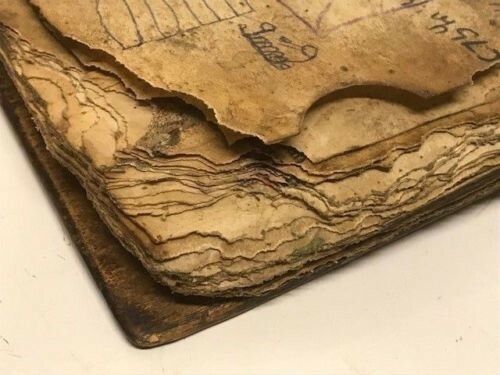 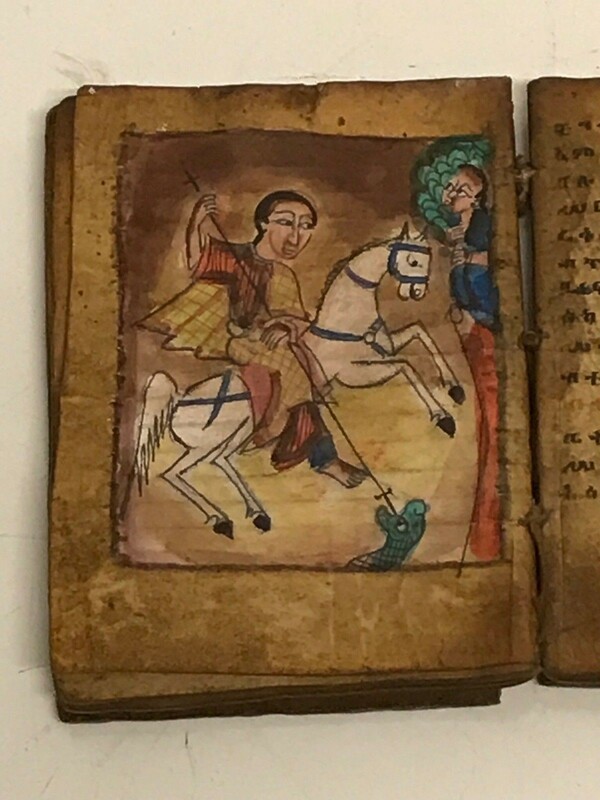 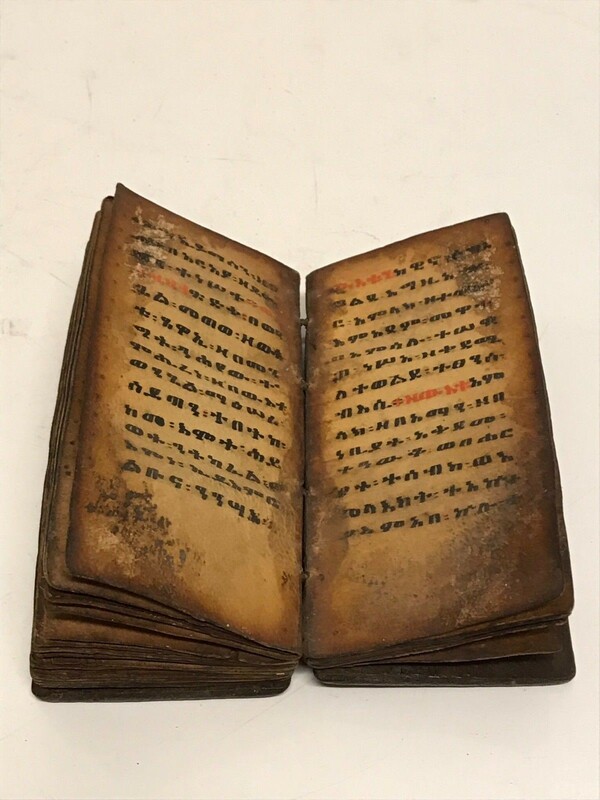 180546 - old Ethiopian handwritten coptic manuscript. 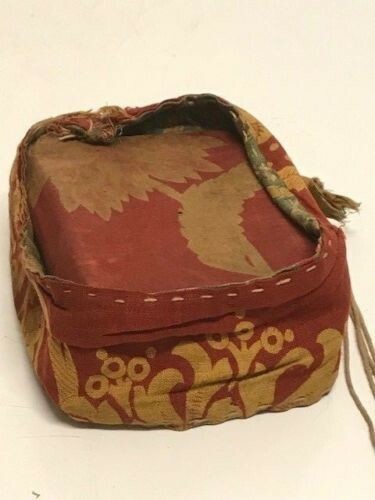 Size are 10 cm x 6 cm. 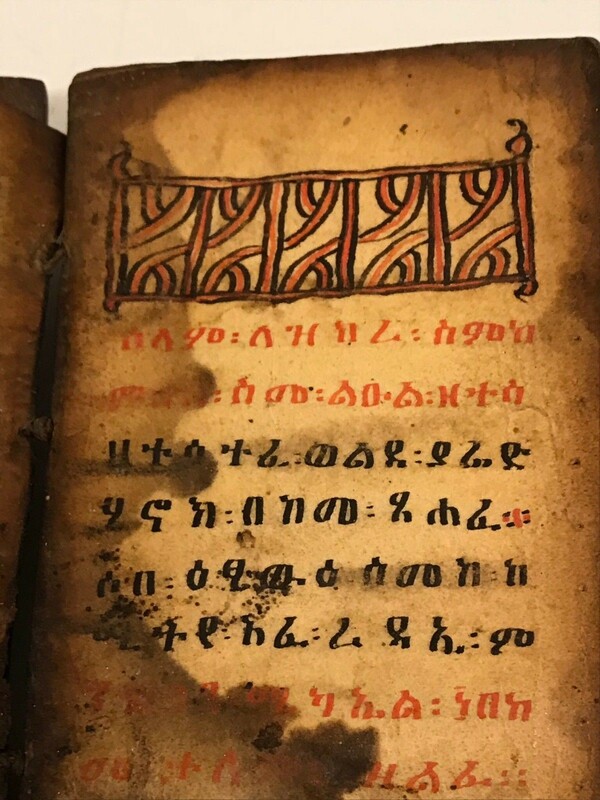 the language of the Ethiopian Church. 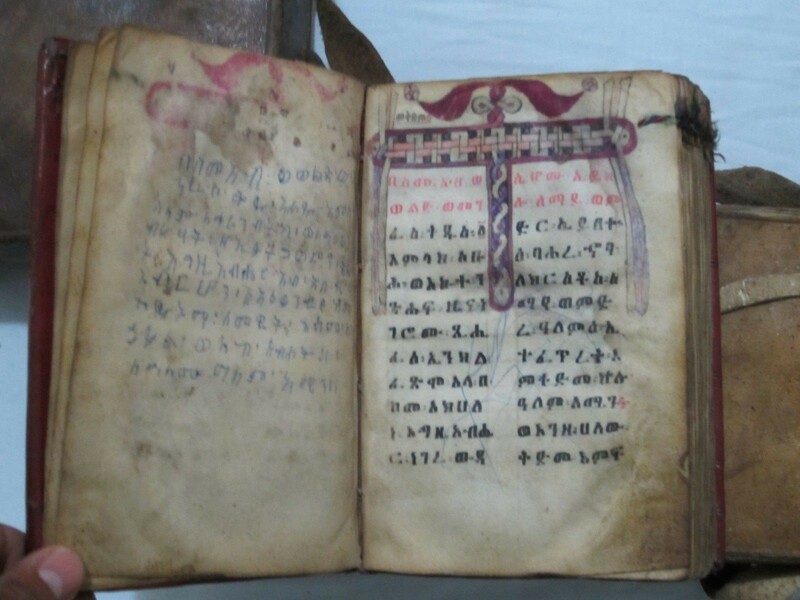 Very Old Ethiopian Coptic Geez Manuscript 200 pages. 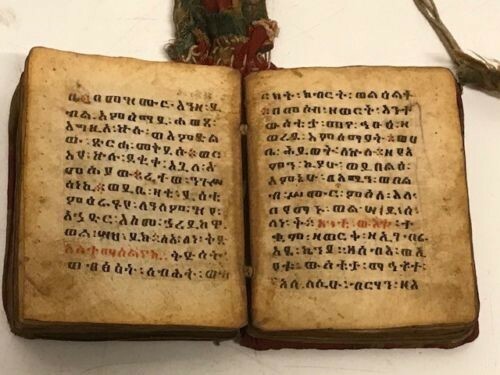 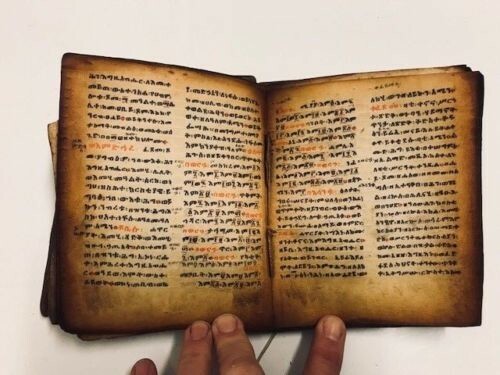 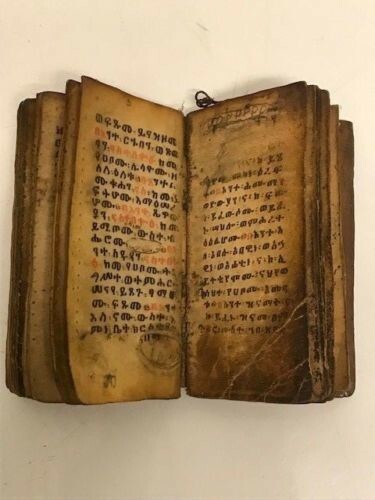 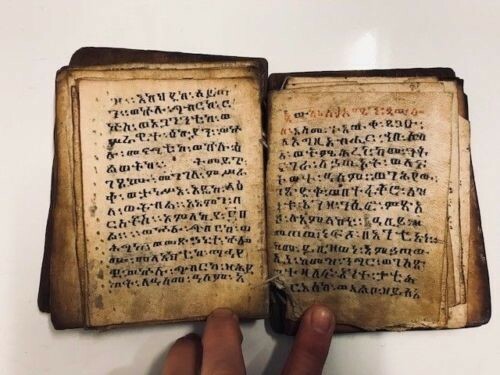 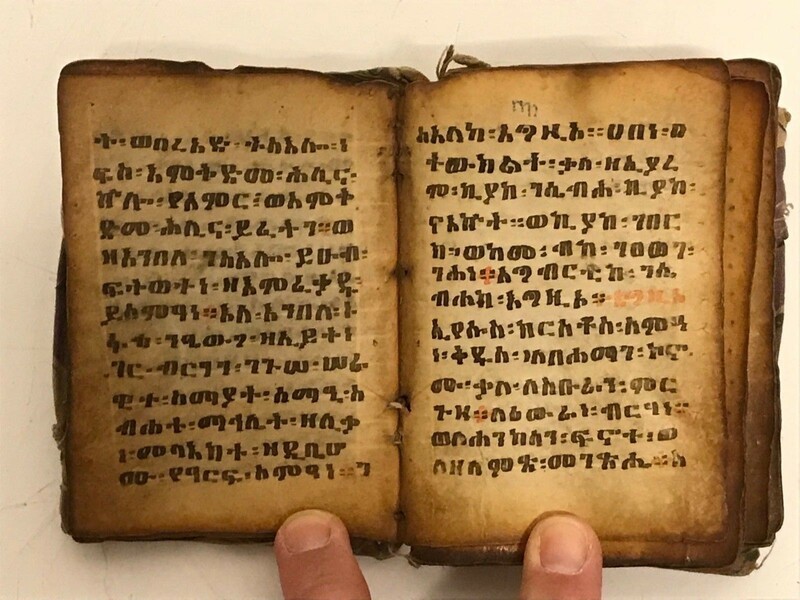 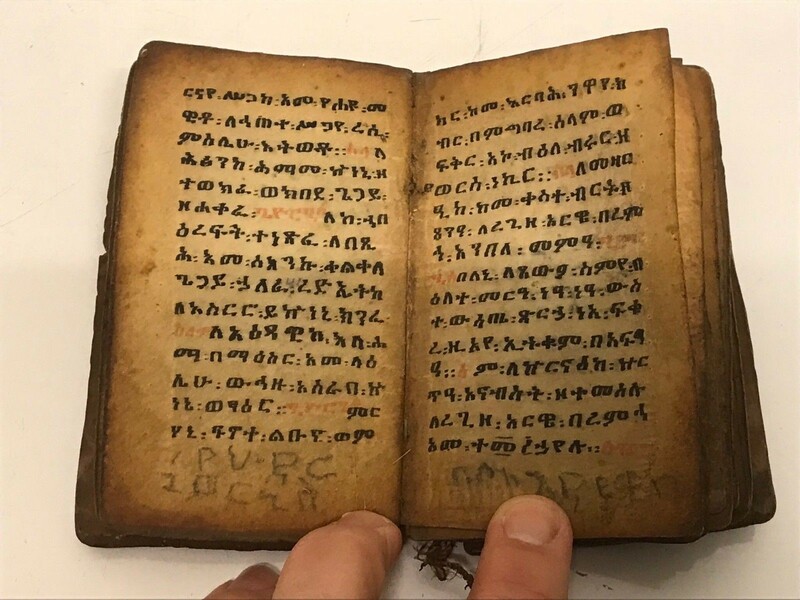 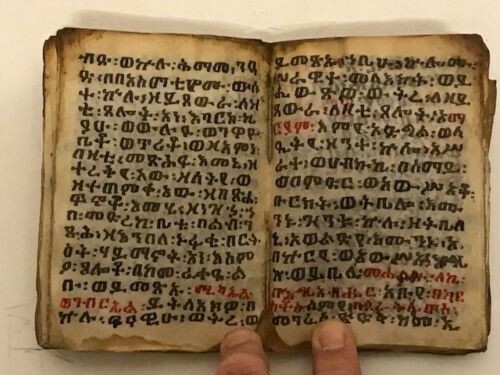 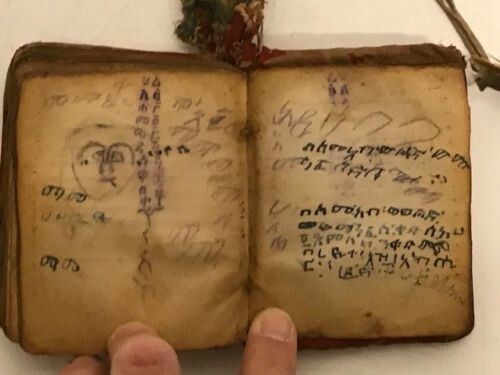 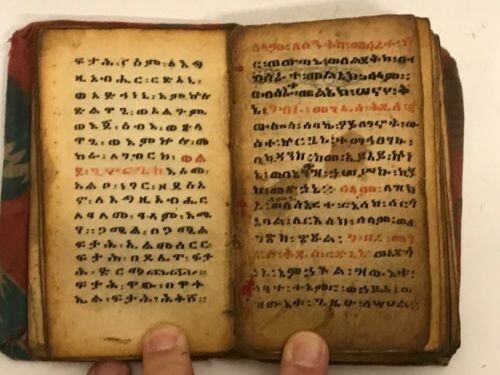 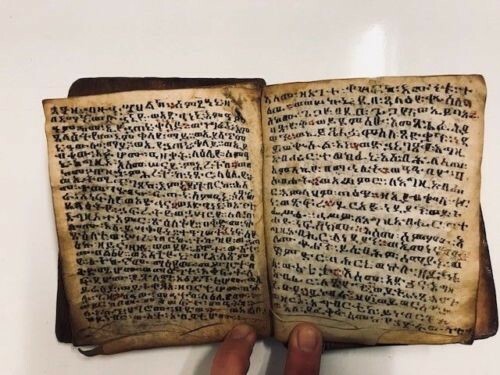 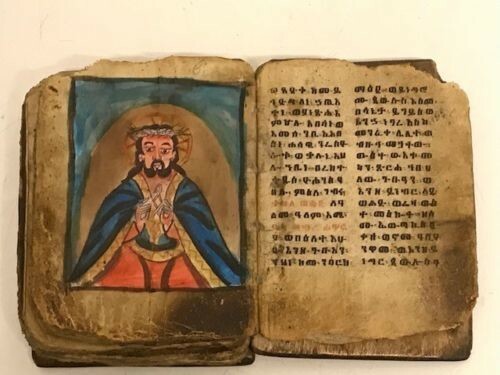 Ethiopian Very Old Coptic Antique Geez manuscript. 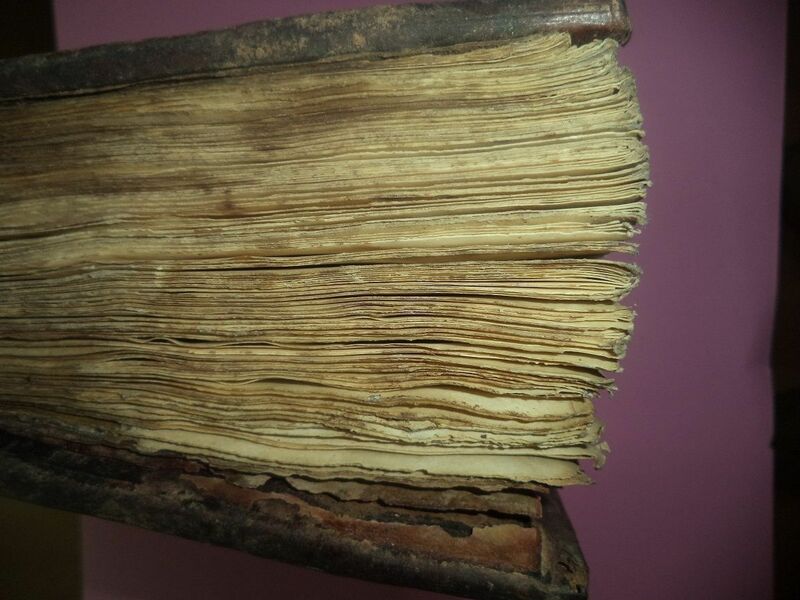 It measures 26 cm x 22 cm and more than 200 years old. 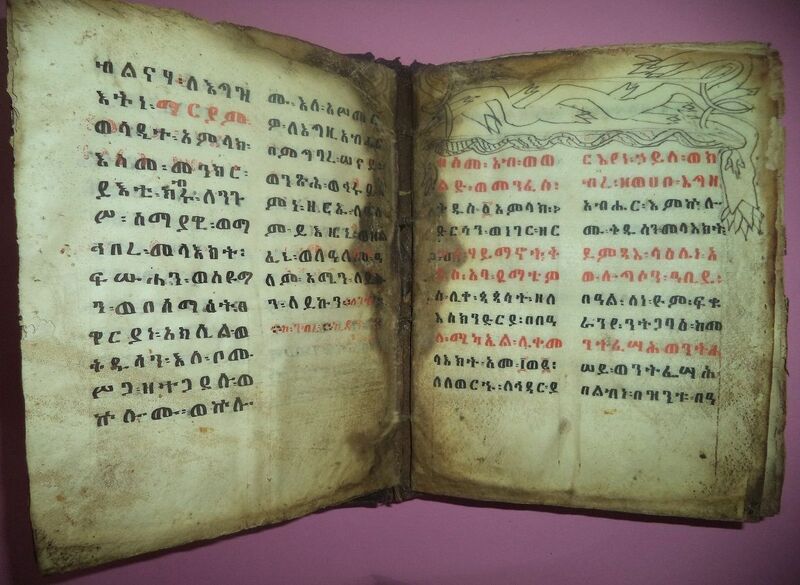 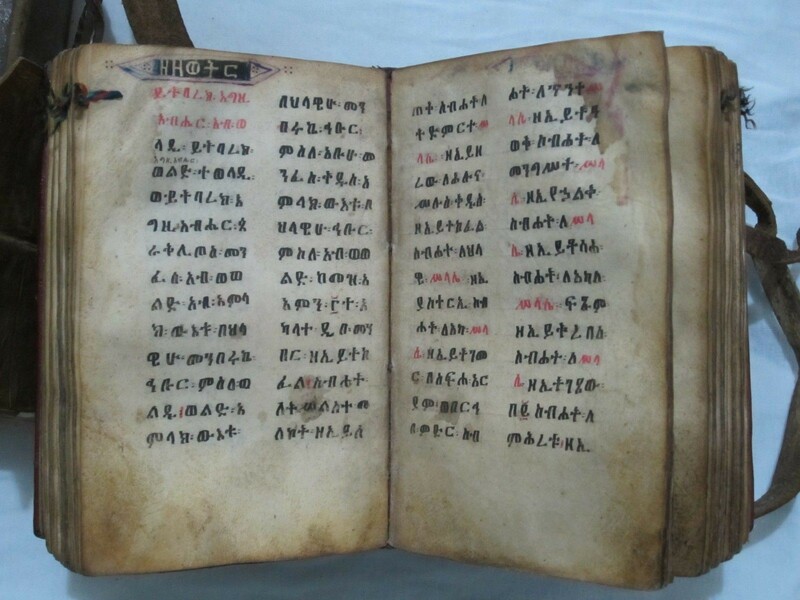 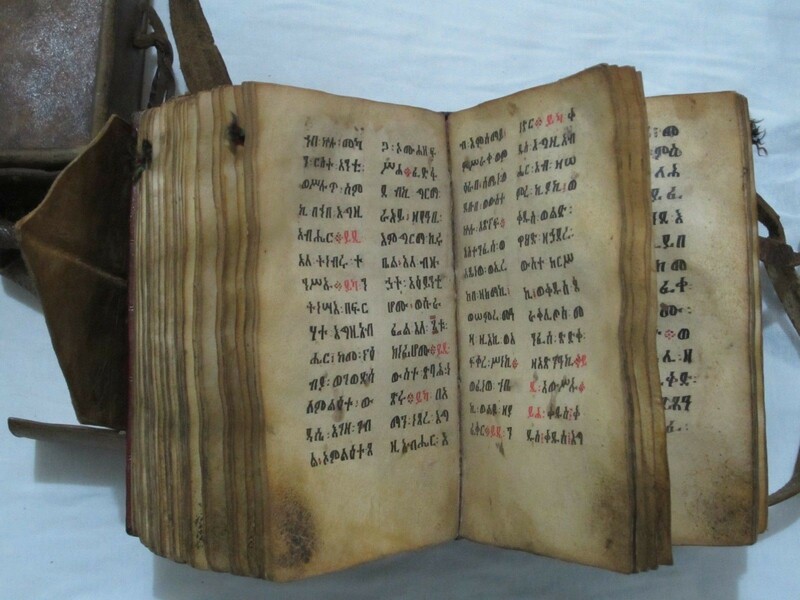 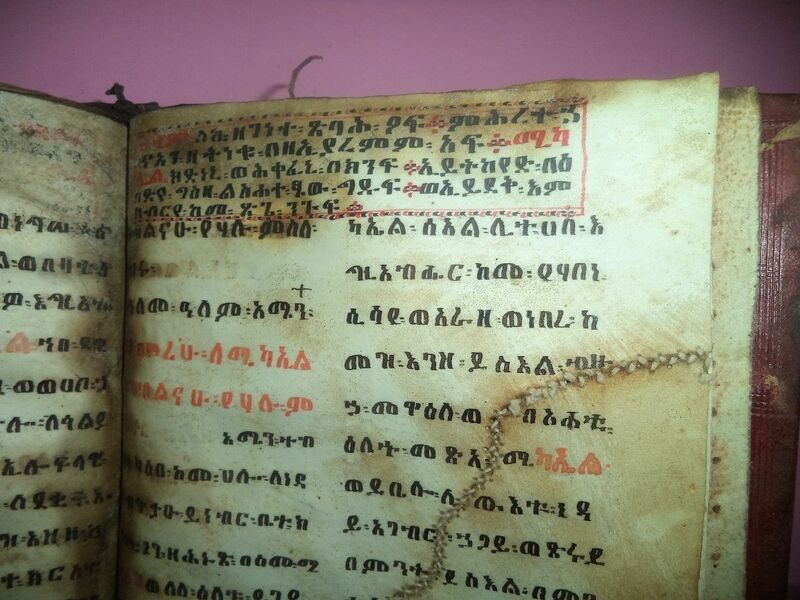 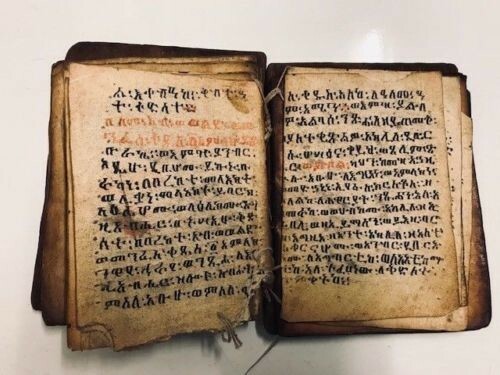 This is a extremly rare Manuscript found in the Ethiopian country with handwriting Ge'ez. 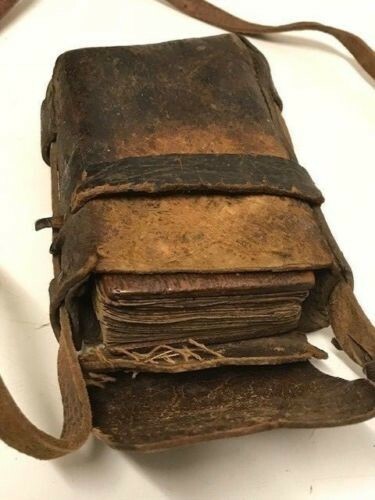 This manuscript has 200 pages or 100 leaves. 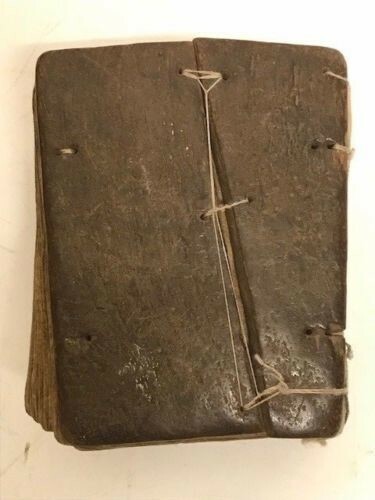 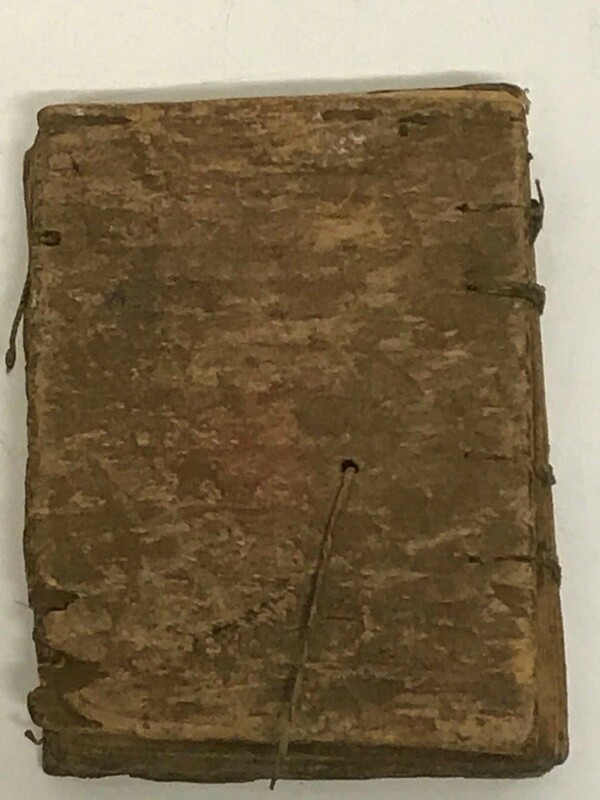 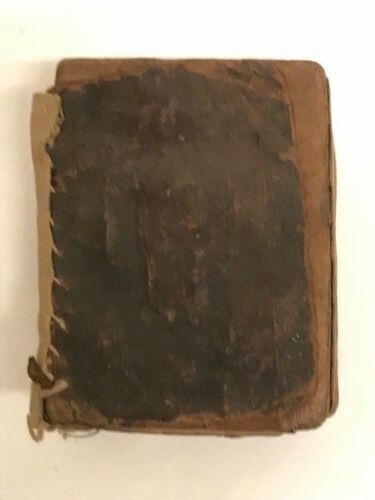 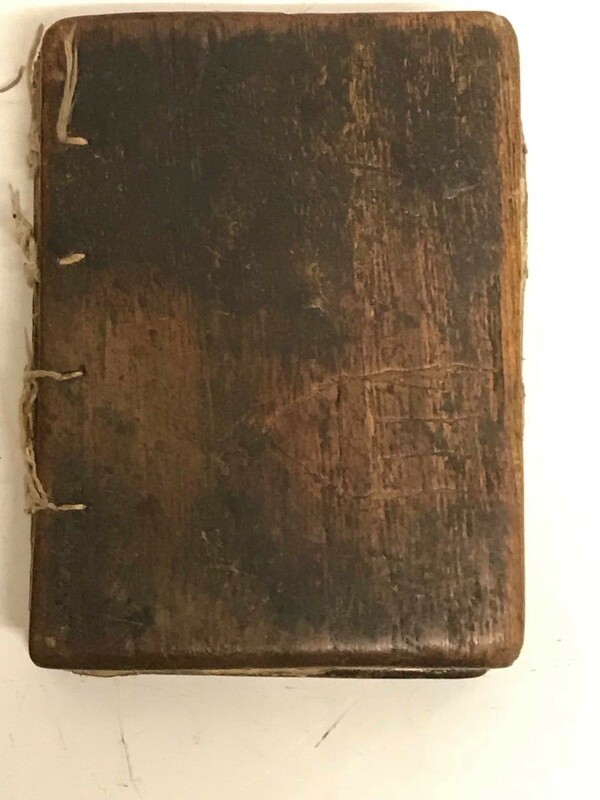 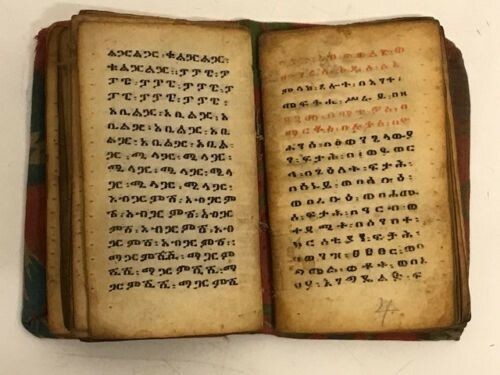 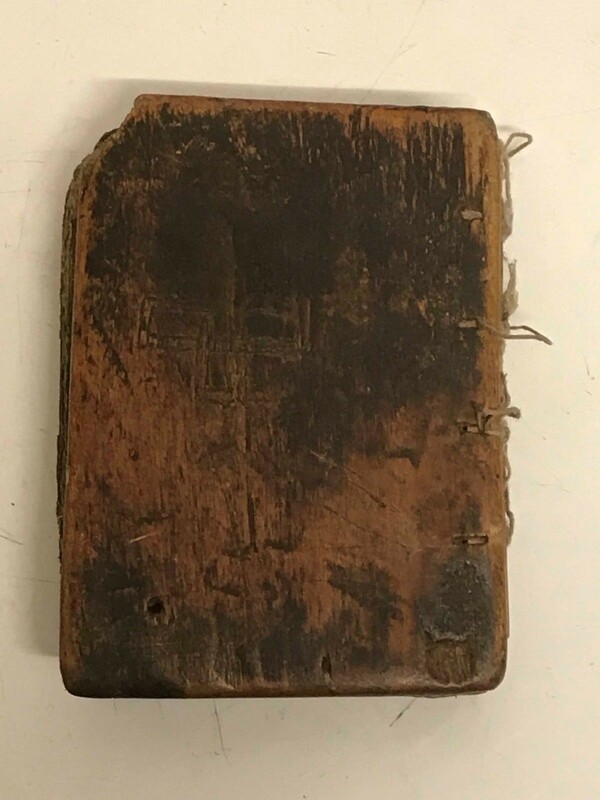 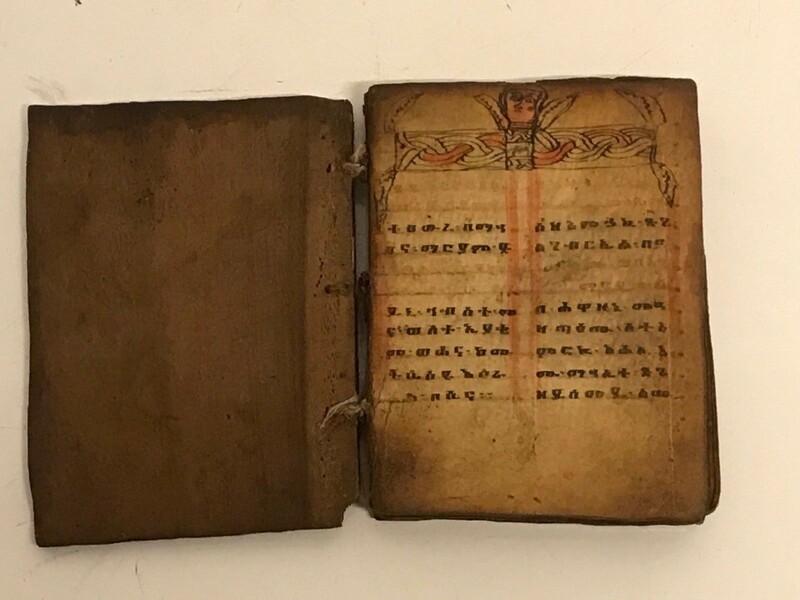 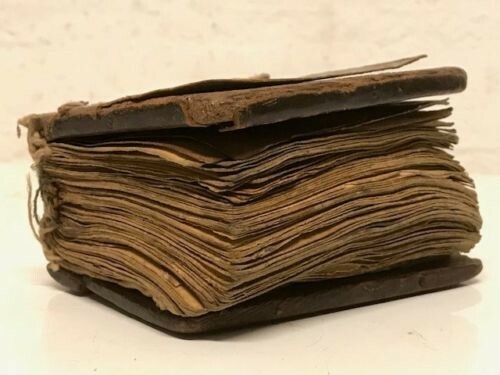 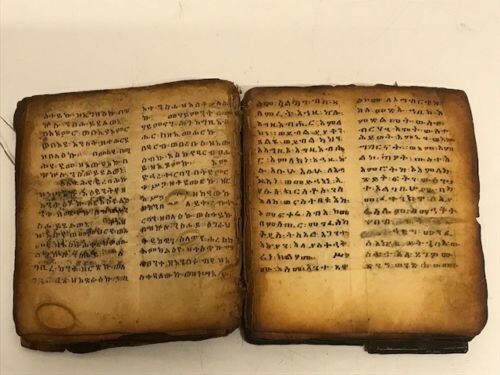 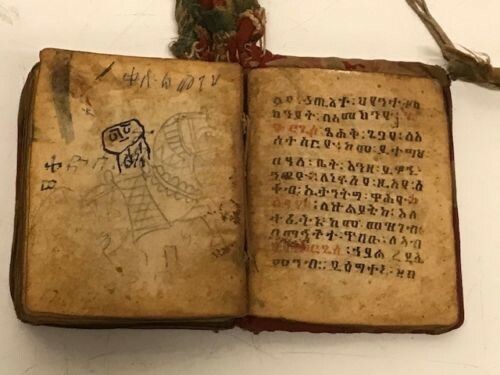 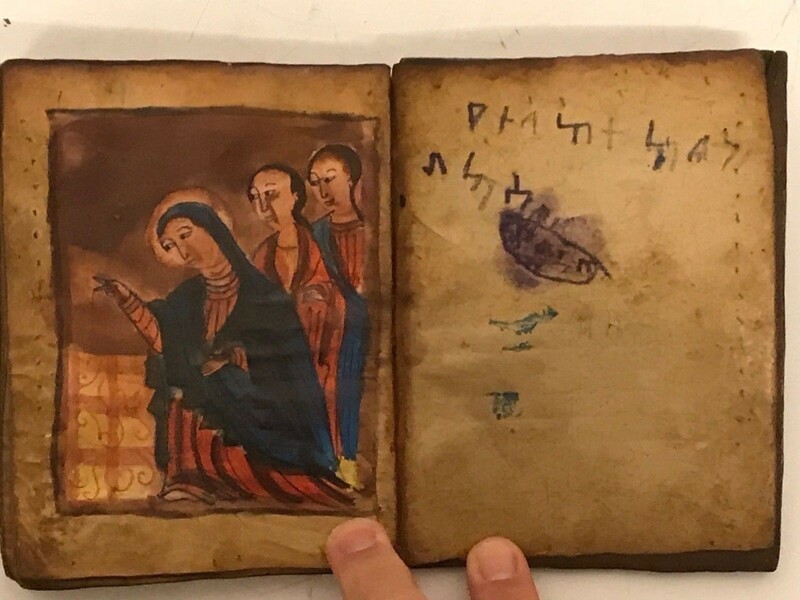 180545 - old Ethiopian handwritten coptic manuscript with 4 icons. 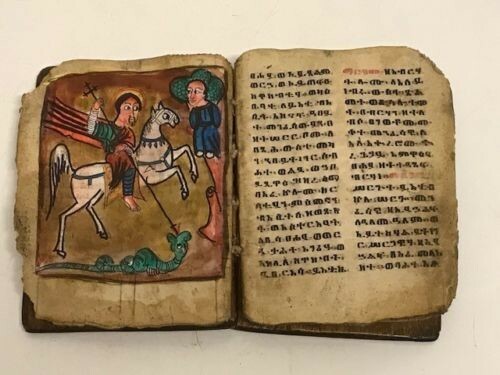 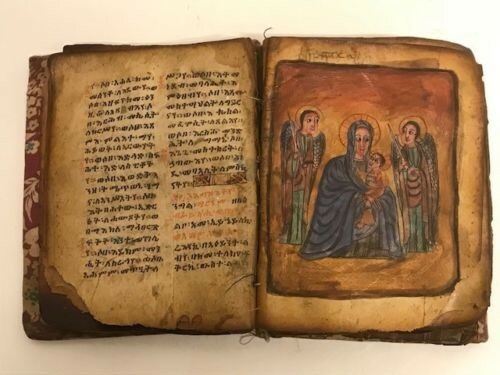 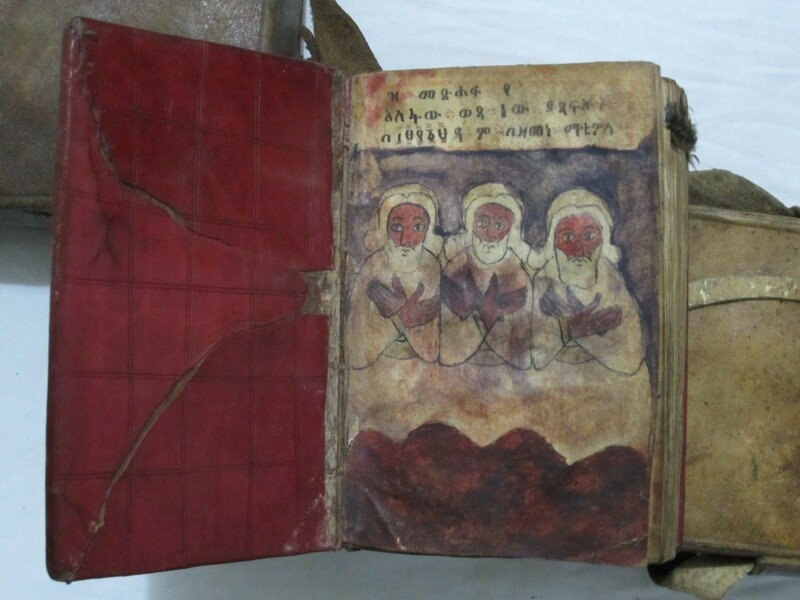 Ethiopia Very old Ethiopian coptic Ge’ez manuscript or bible with 4 handpainted icons. 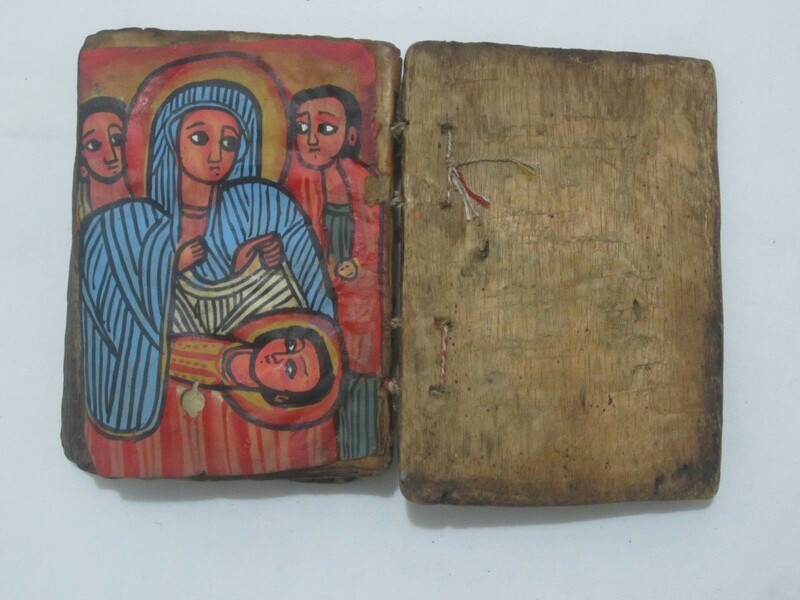 This Coptic manuscript is made in the 18th century. 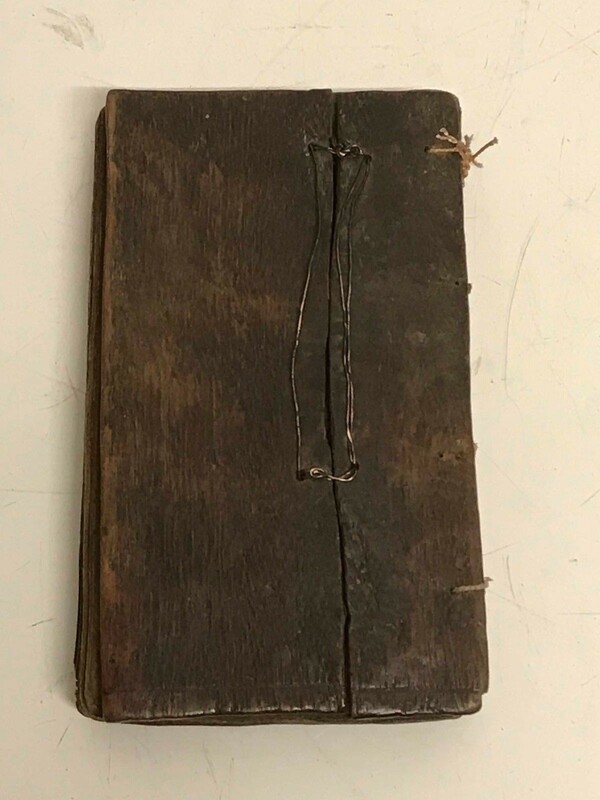 Size are 14 cm x 10 cm. 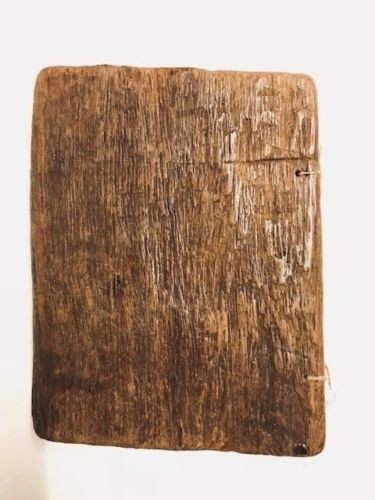 Total 74 pages with wood covers. 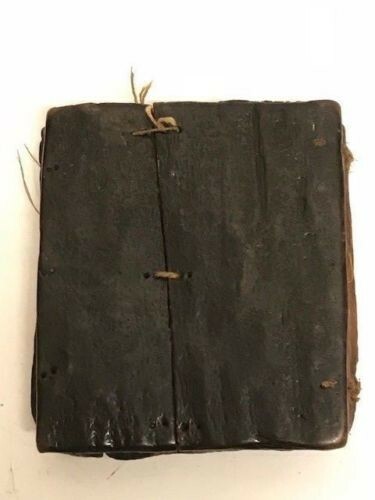 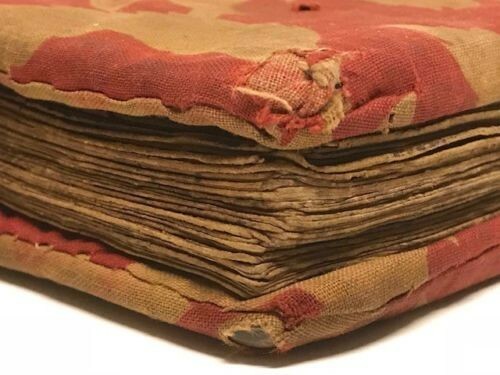 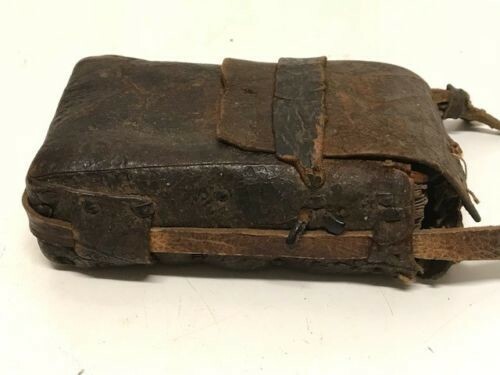 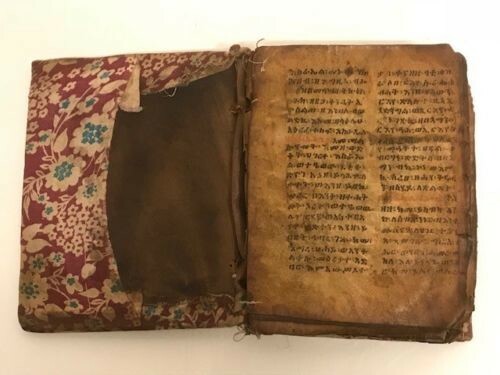 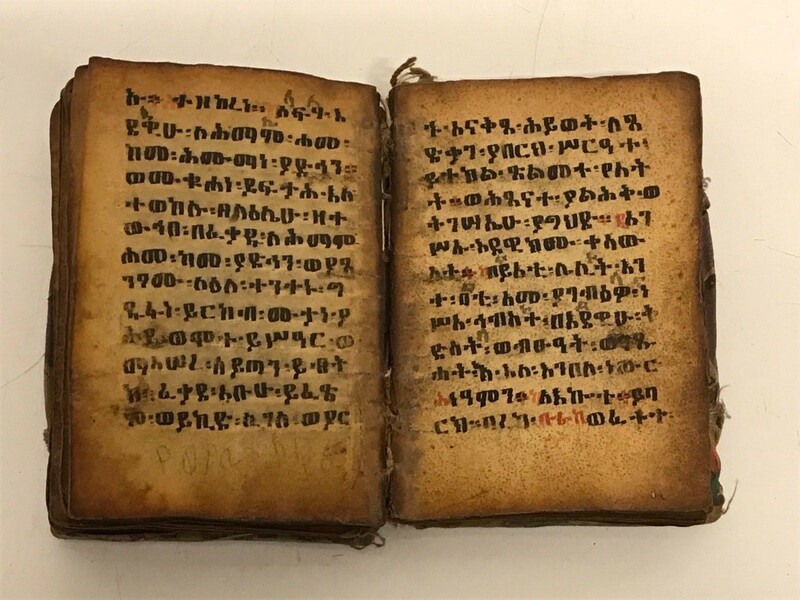 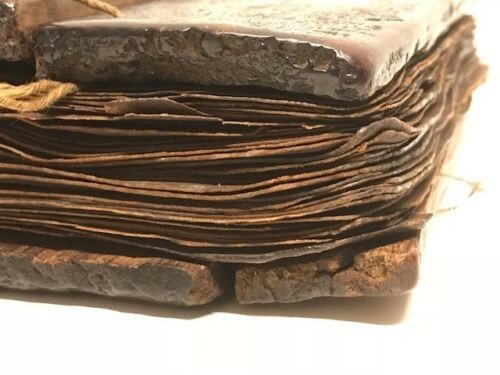 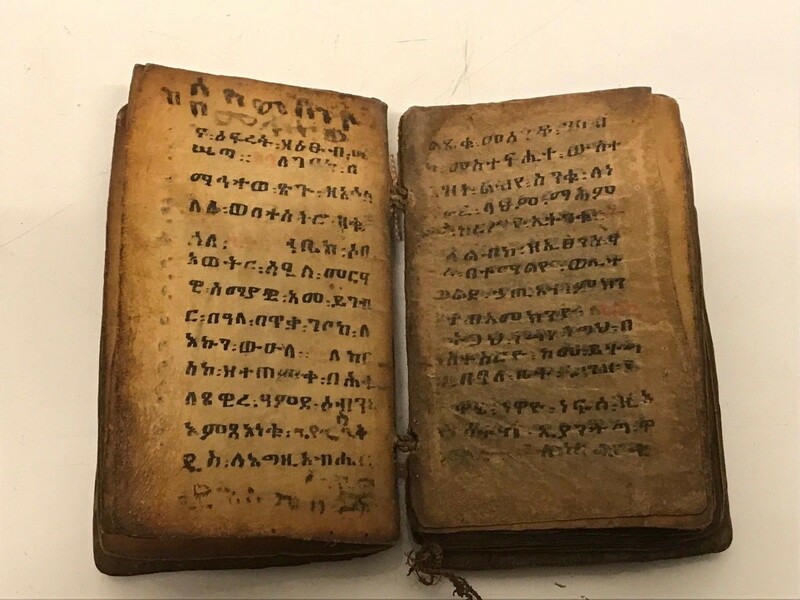 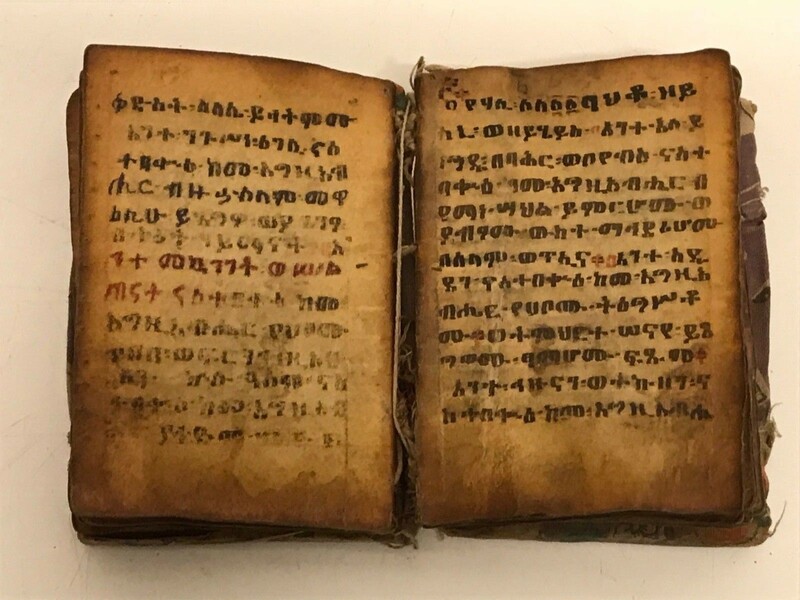 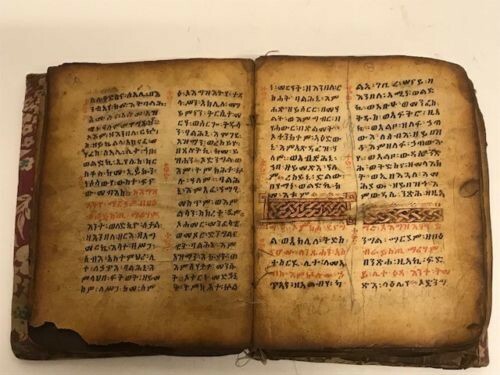 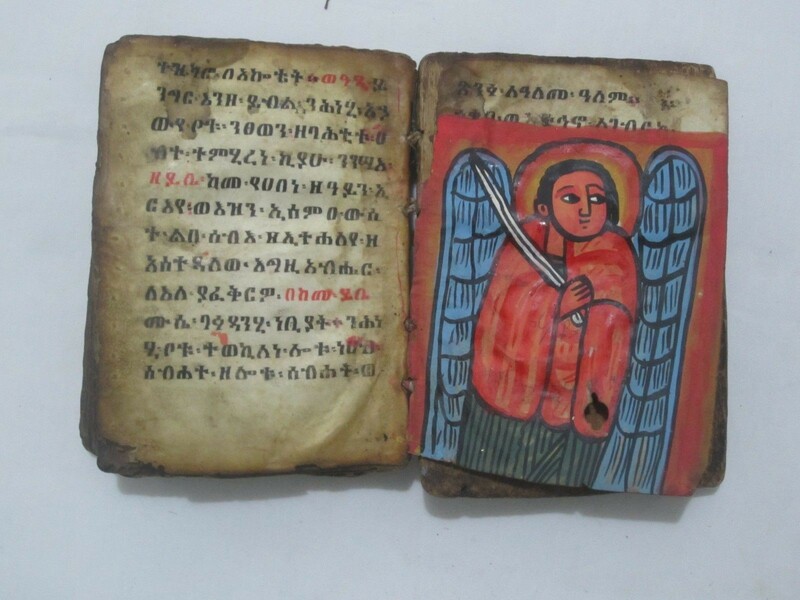 Ethiopia Very old Ethiopian coptic Ge’ez manuscript or bible in a leather priest bag. 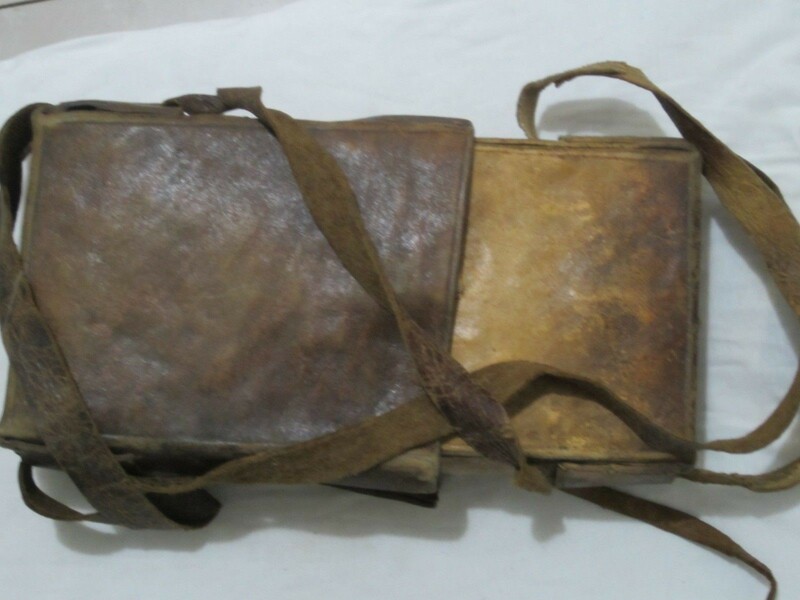 Size are 22 cm x 16 cm. 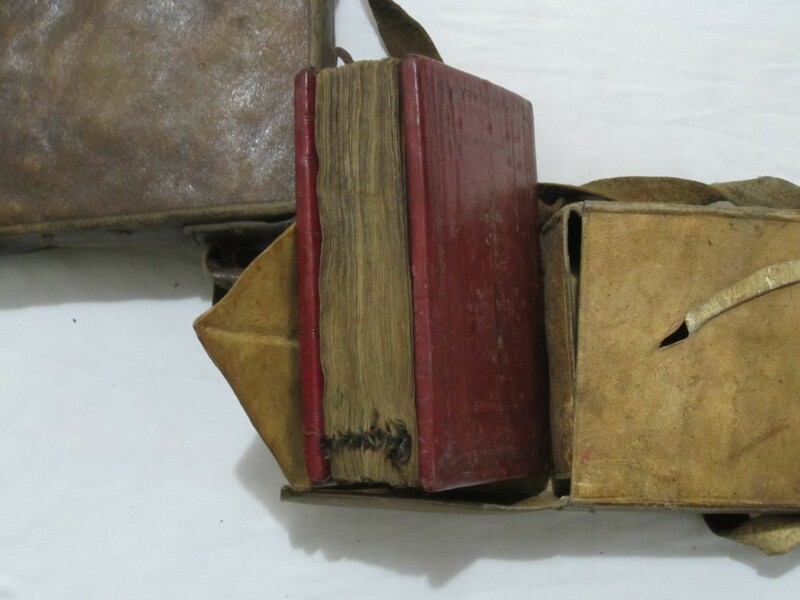 Total 248 pages with 124 leaves with wood covers with red leather. 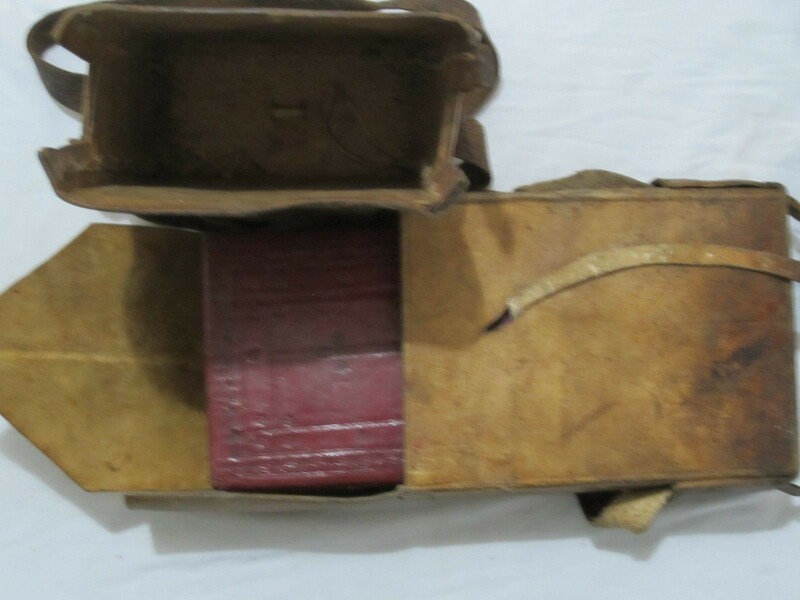 Size are 12.5 cm x 6 cm. 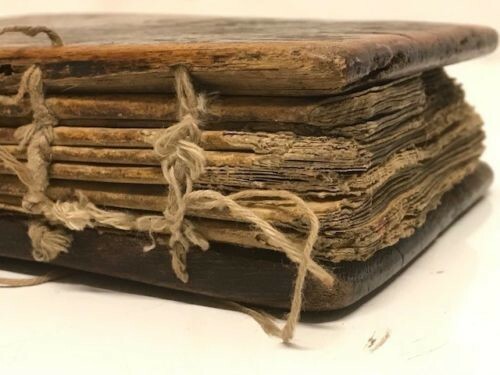 Total 82 pages with 41 leaves with wood covers. 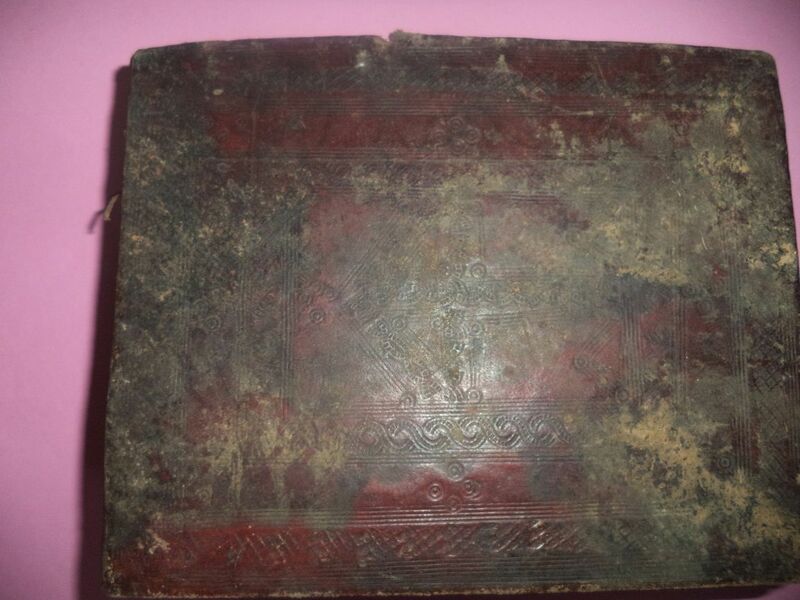 Size are 14 cm x 8 cm. 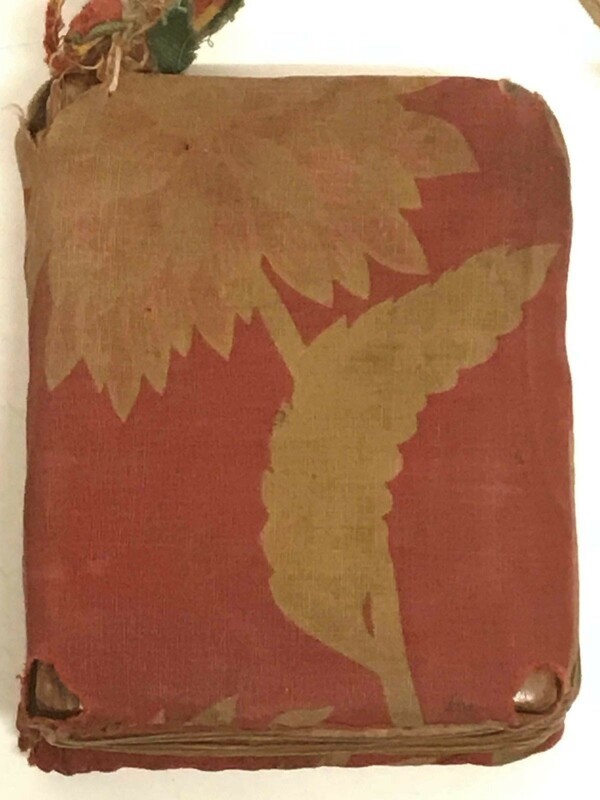 Total 80 pages with 40 leaves with wood covers. 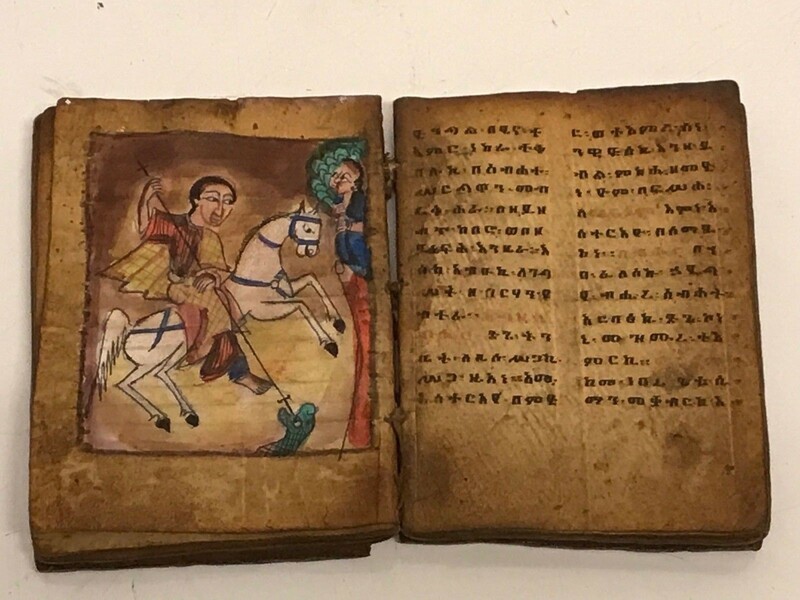 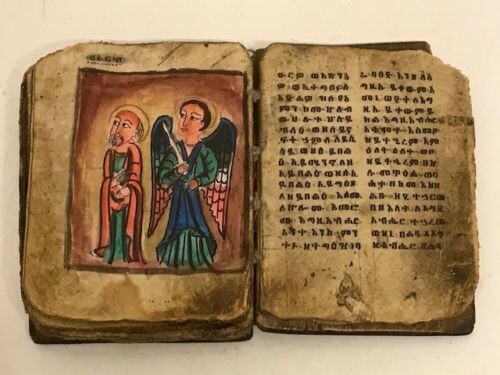 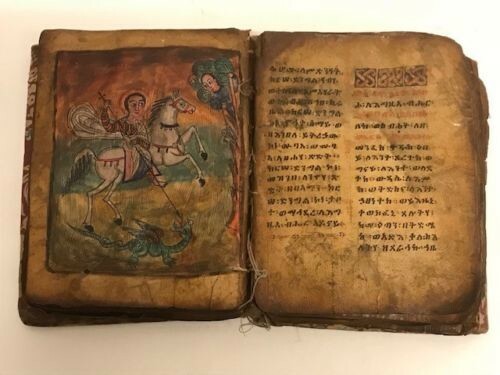 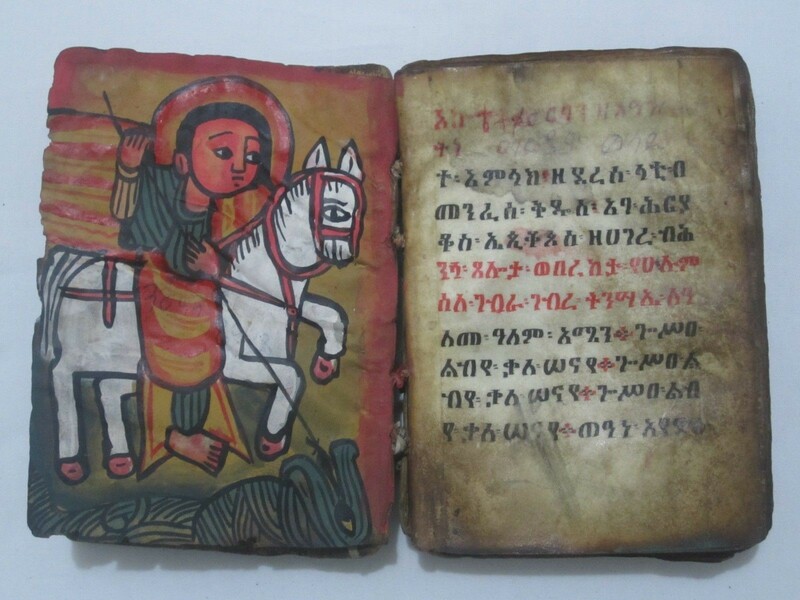 Ethiopia Very old Ethiopian coptic Ge’ez manuscript or bible with 5 handpainted icons. 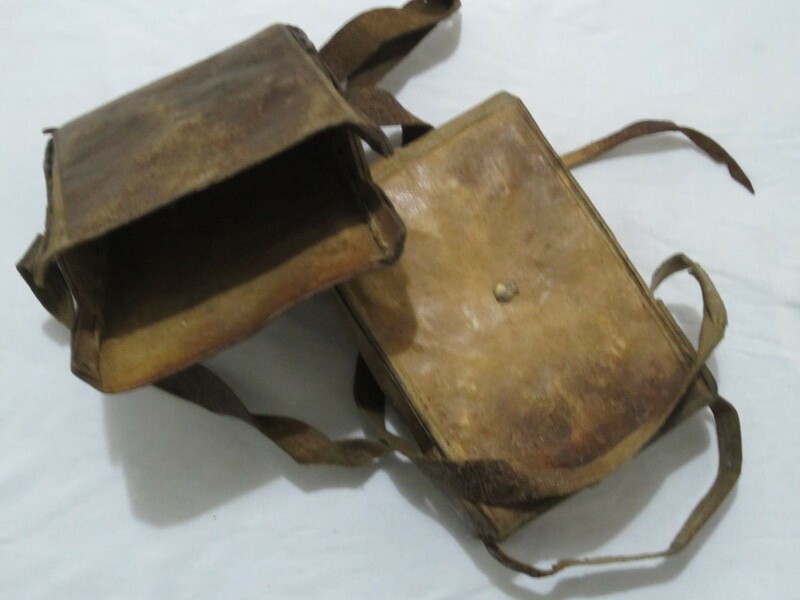 Size are 14.5 cm x 10.5 cm. 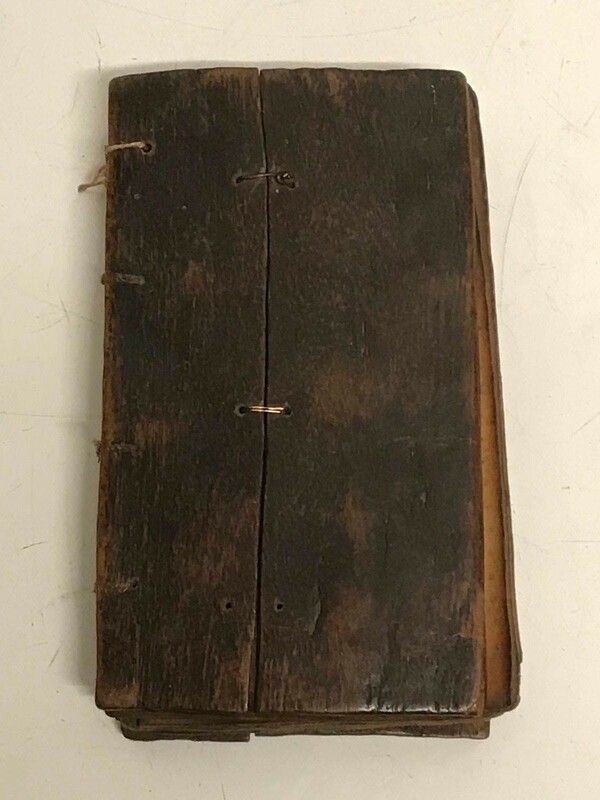 Total 96 pages with wood covers. 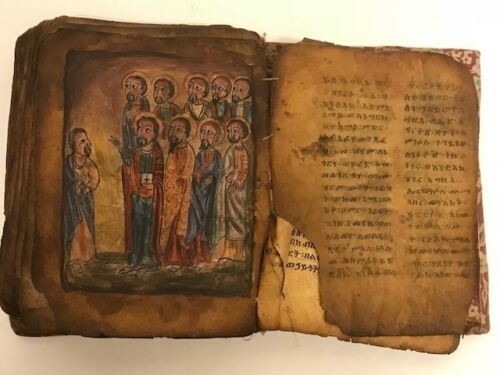 Ethiopia Very old Ethiopian coptic Ge’ez manuscript with 7 handpainted icons. 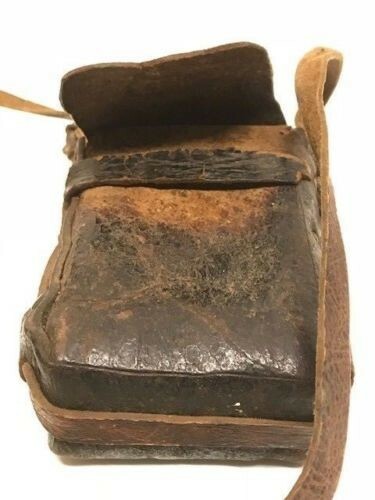 Size are 15 cm x 11 cm. 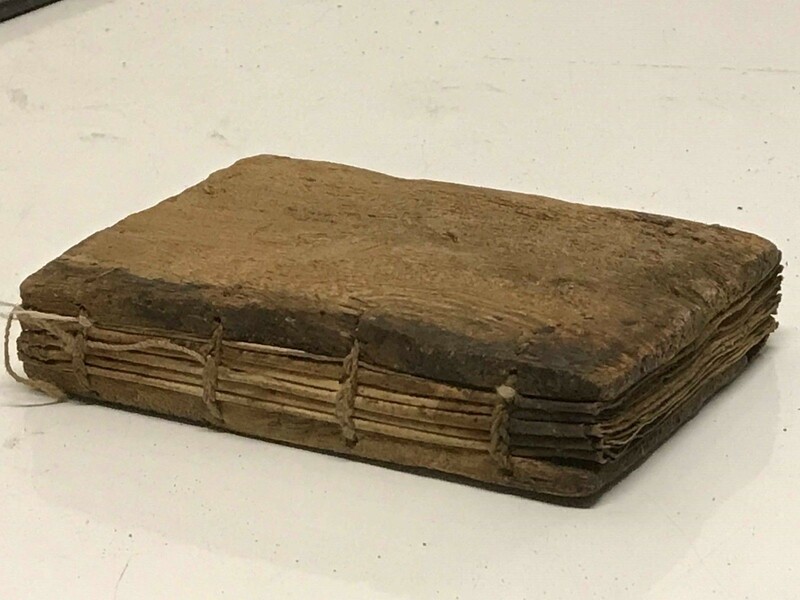 Total 142 pages with 71 leaves with wood covers. 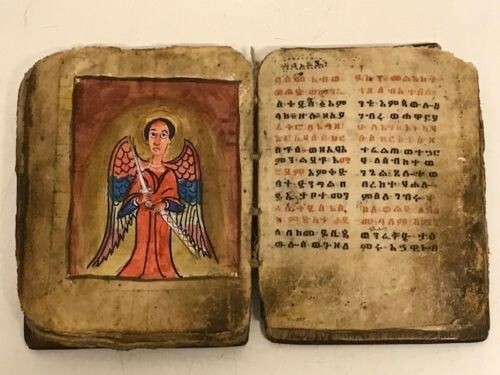 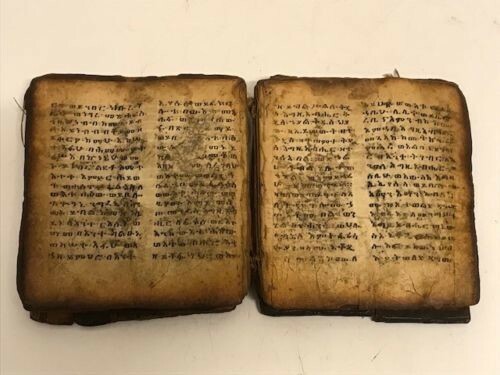 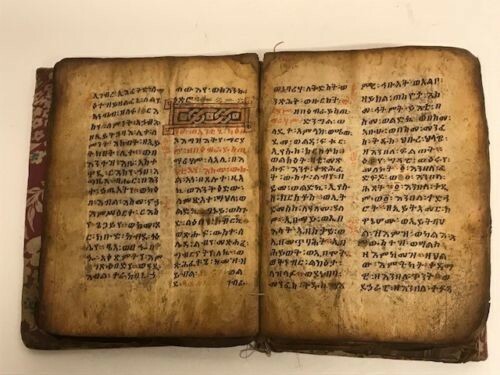 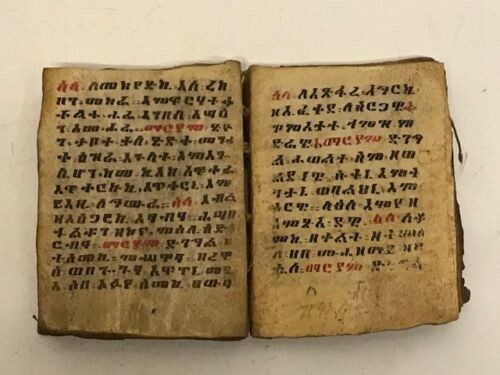 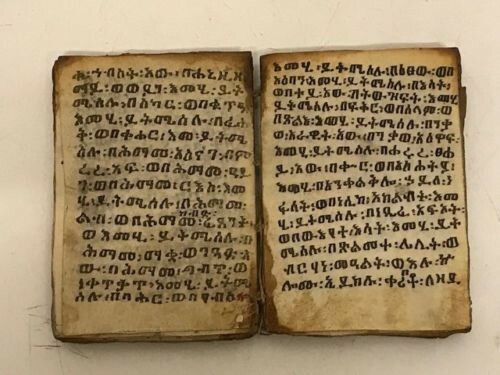 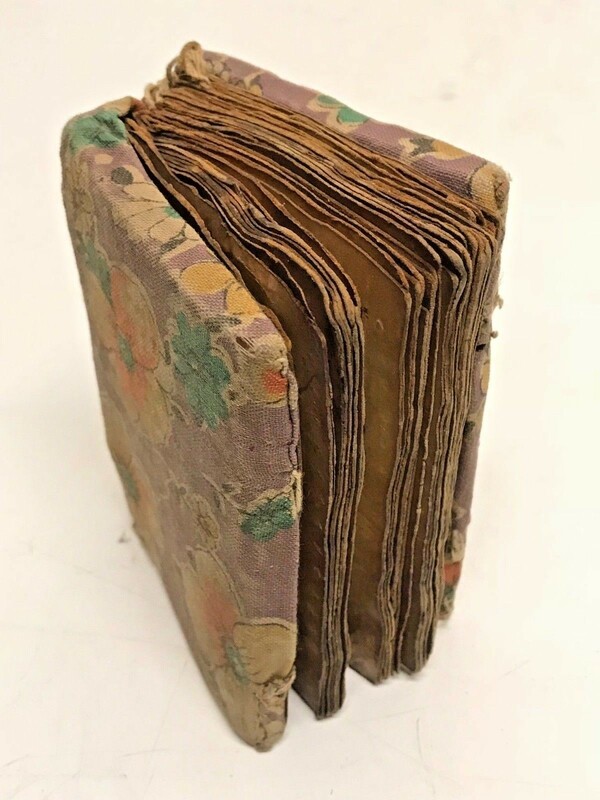 180671 - Antique Ethiopian handwritten coptic manuscript. 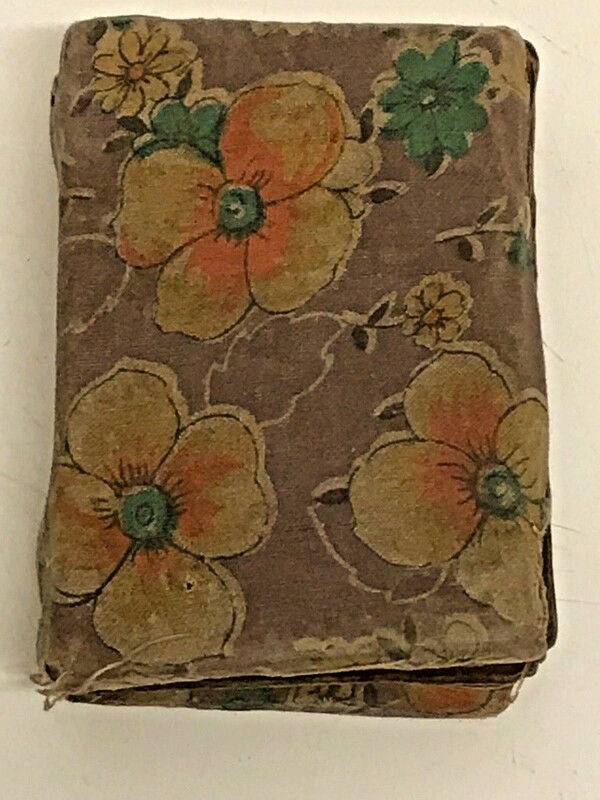 Size are 12 cm x 8 cm. 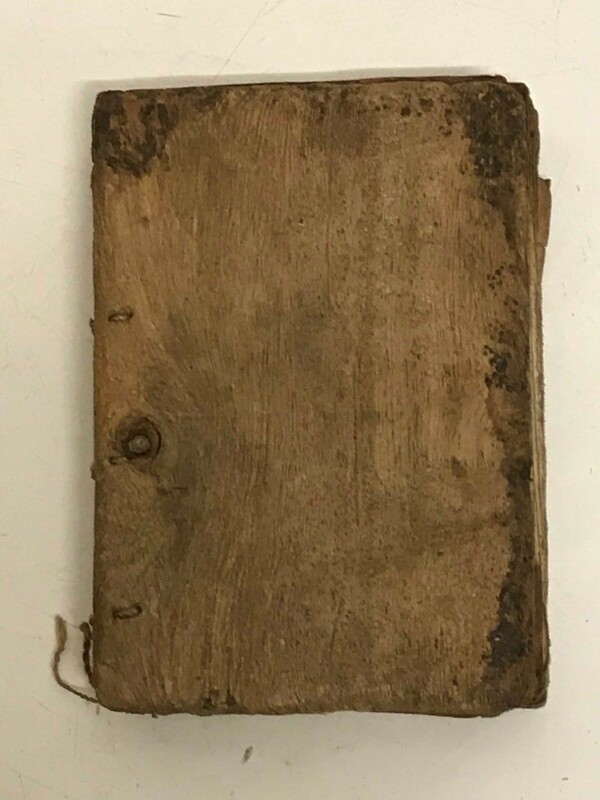 Total 58 pages with wood covers and cotton.